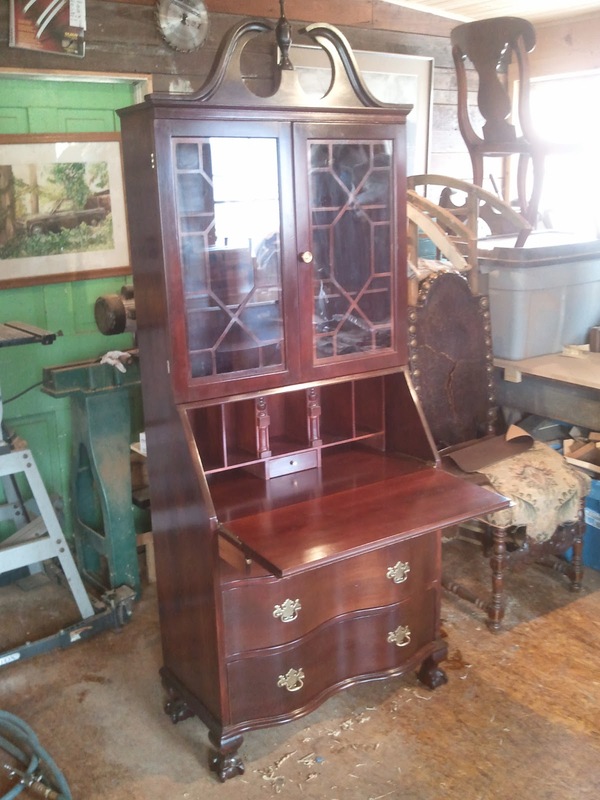 Below is a page from a catalog of the Northwestern Cabinet Company showing an almost identical desk to the one I worked on. 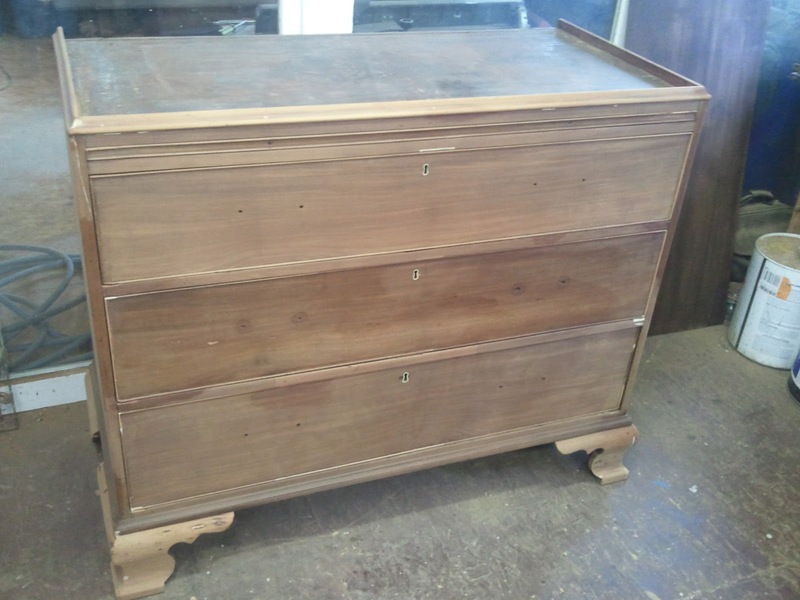 The differences I can see are two more drawers inside the desk compartments as well as a slightly more elongated pediment. The original sale price in the catalog was $47.40. 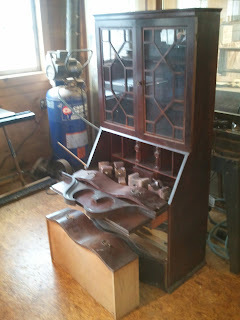 The desk is referred to in the catalog as a "Governor Winthrop" desk. 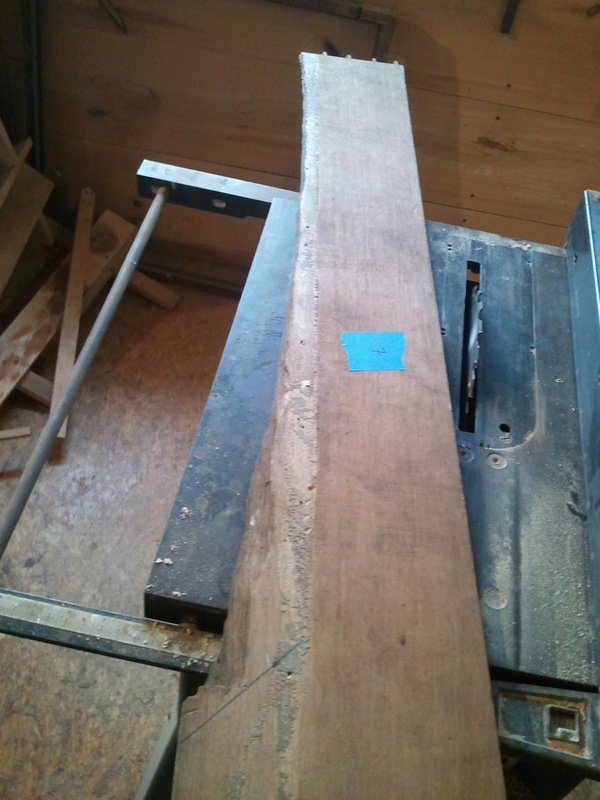 This is a bit of a misnomer as it was named after Governor John Winthrop of the Massachusetts Bay Colony. 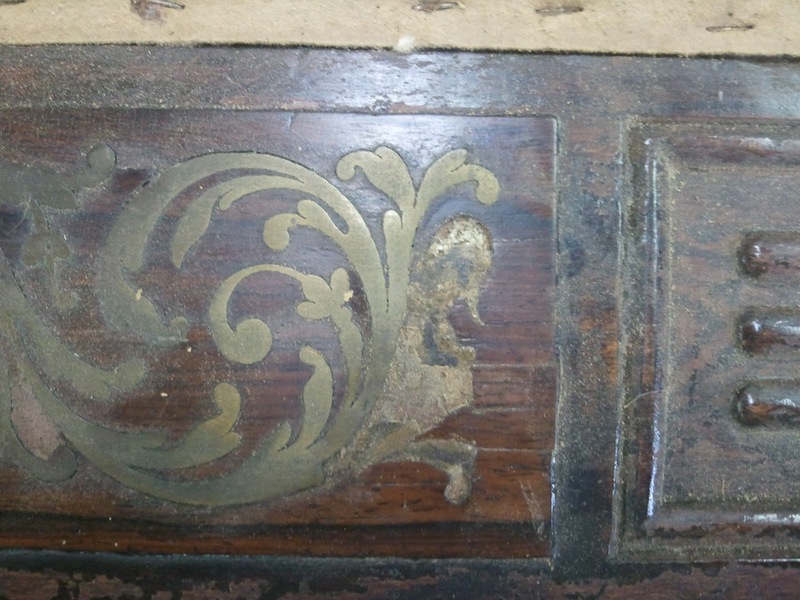 Governor Winthrop lived during the 17th century while the design of this desk reflects a mid to late 18th century taste and would most closely be associated with the Chippendale style. 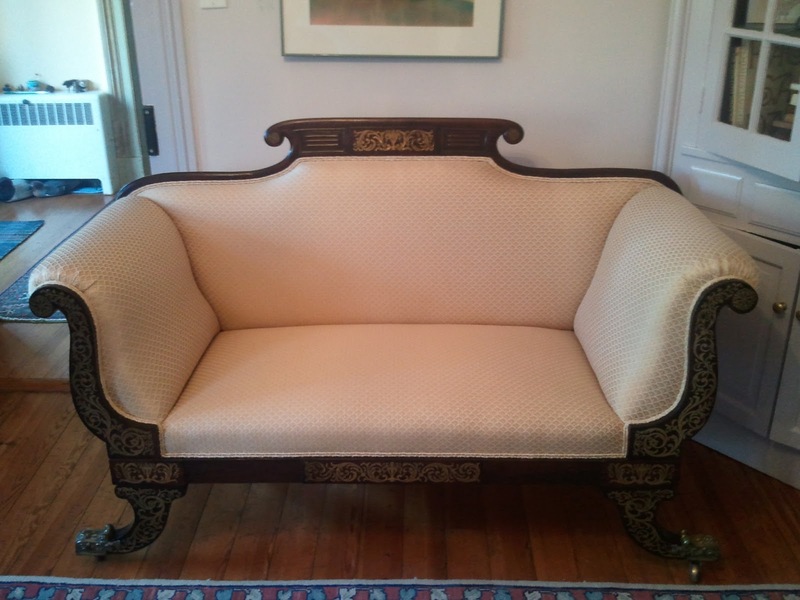 Wikipedia shed some light on the origin of this name, saying that it was first coined in 1924 buy the Winthrop Furniture Company of Boston Massachusetts, who offered the "Gov. 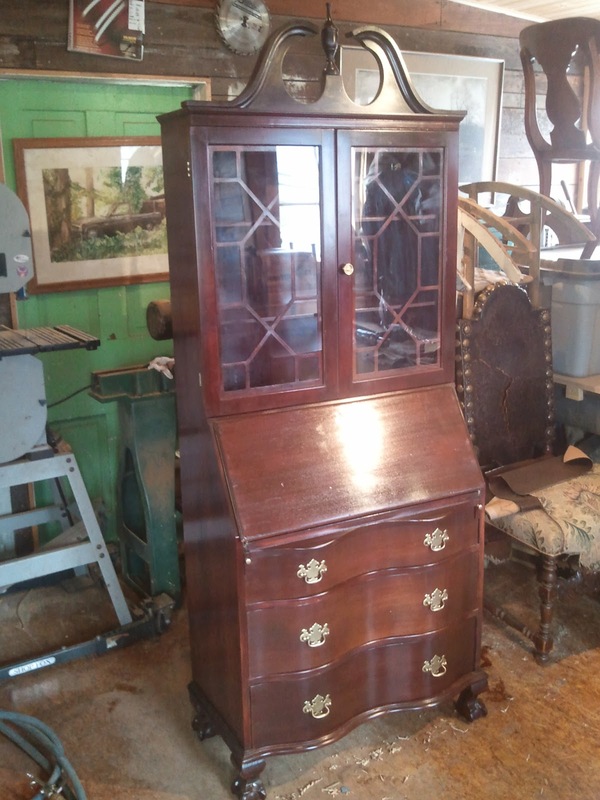 Winthrop Desk" during the Colonial revival period in American furniture manufacturing. 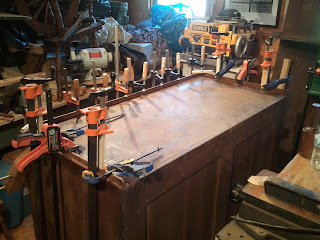 The use of this term dates the desk I worked on to after 1924 and realistically it was probably made in the 1930's, 1940's, or even as late as the 1950's. 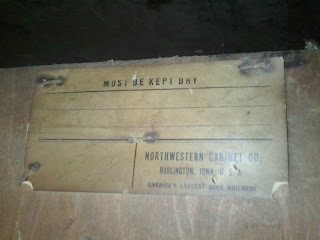 Below is a photo of the label on the back of the desk. 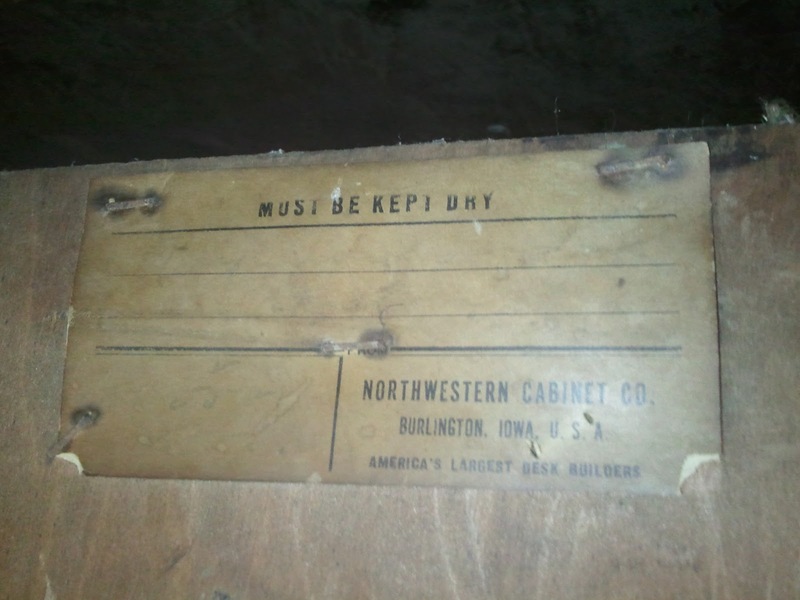 The name of the manufacturer is seen in the bottom right hand corner of the label. 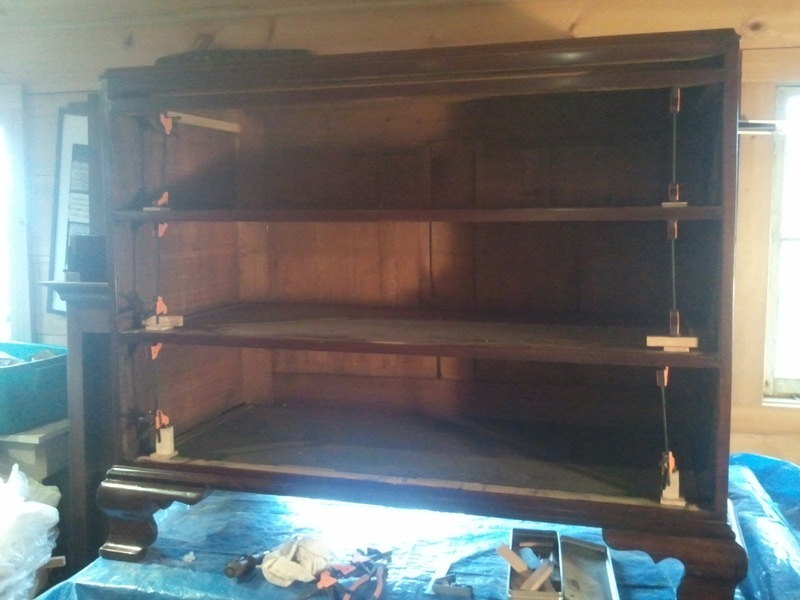 The advertisement above mentions that the desk was originally offered in a Walnut or Mahogany finish. 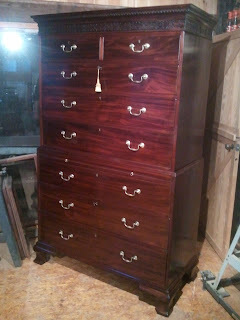 Indeed, the primary wood used in this piece is Birch that has been stained and finished to resemble Mahogany. Birch was commonly used in this fashion because when stained, it has a look similar to Mahogany, and was much less expensive to use since it is a domestic wood. 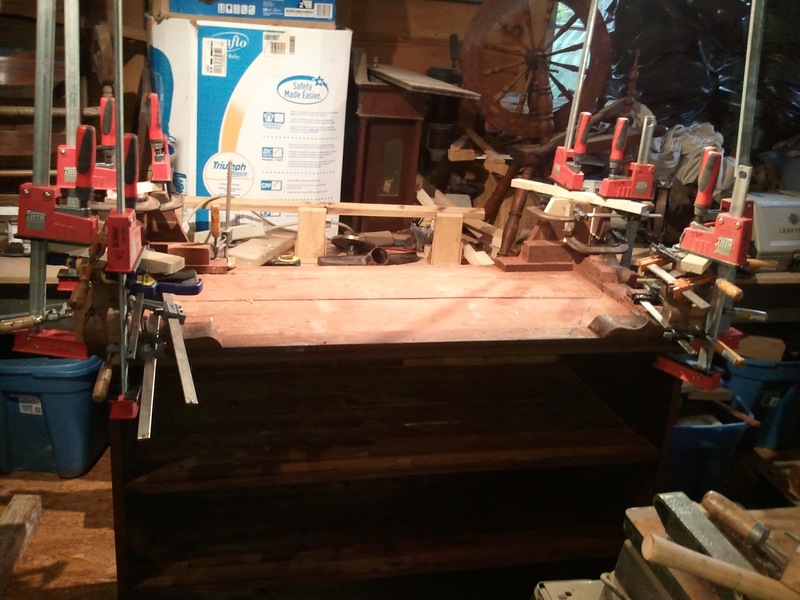 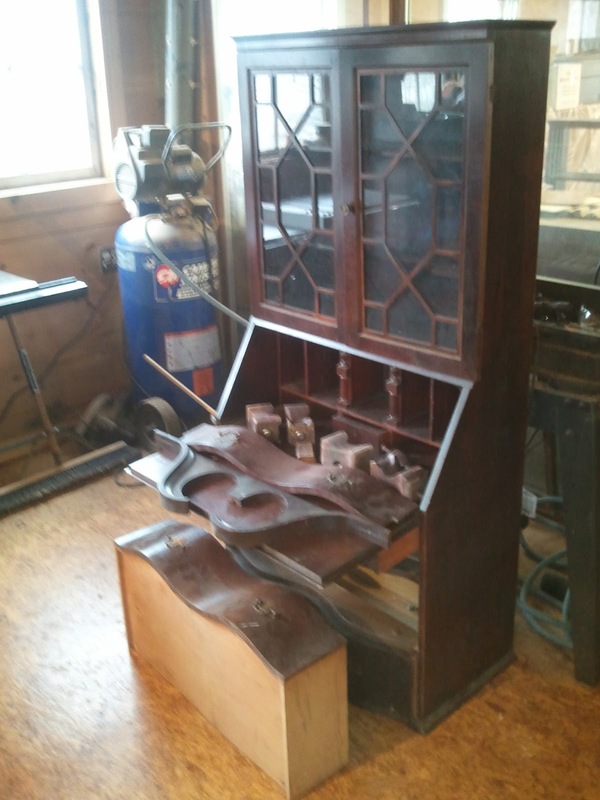 Below is a photo of the desk as it came into my shop. 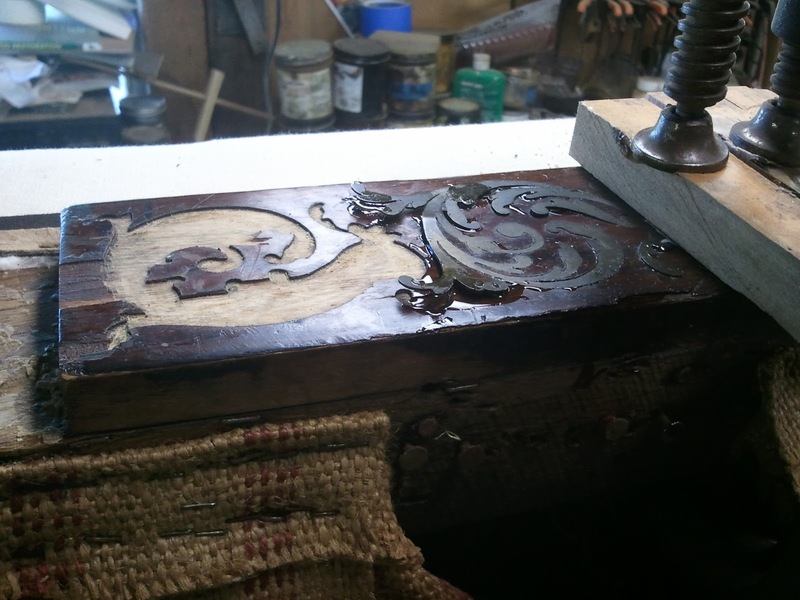 One of the drawer fronts had become loose, the feet were loose and missing portions on the claws, the finial was missing a portion, and the finish needed a cleaning and touch up. 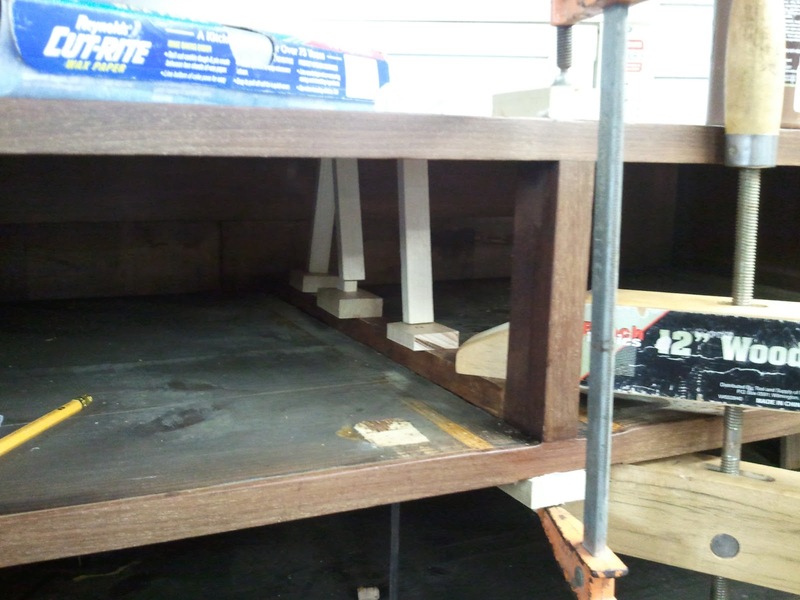 In addition, the false dividers for the glass were warped badly as was one of the drawer bottoms. One last piece was that the plating on the hardware had come off , revealing the metal sub layer which was pitted and rusted. The owner and I decided to replace the hardware, as seen later in the post. 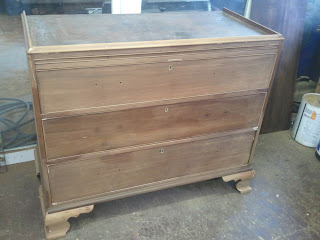 This photo shows the top drawer front being glued to the rest of the drawer. 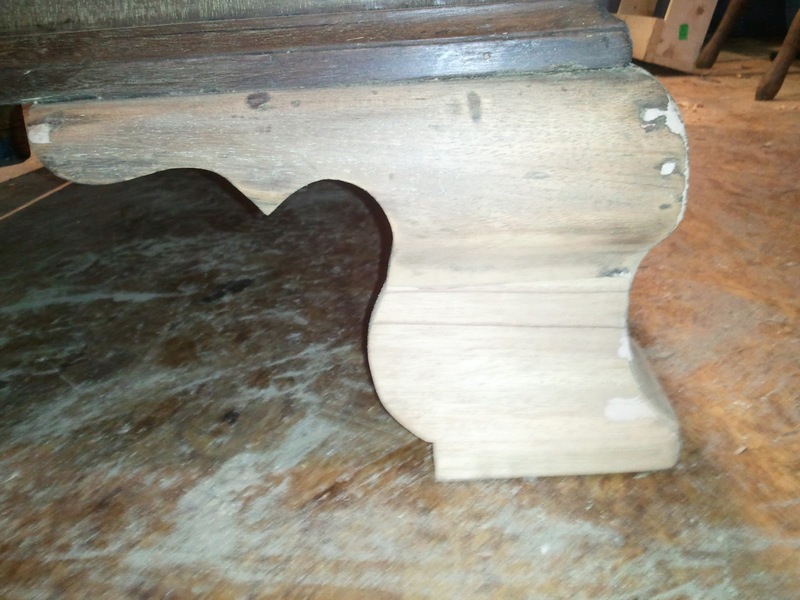 The glue block used to support the finial had become loose. This photo shows the piece being reattached to the back side of the pediment. 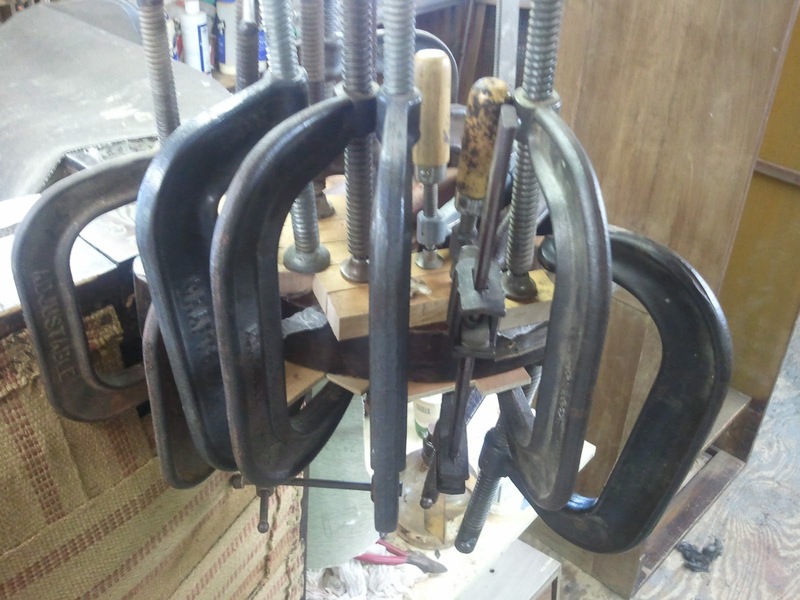 As stated above, several portions were missing from the "claws" of the feet. 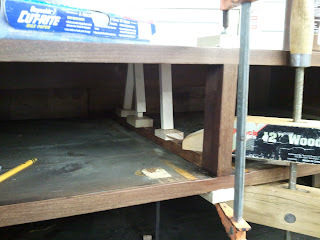 This was due to glue failure and the fact that the feet were not solid, but comprised of several boards glued together. 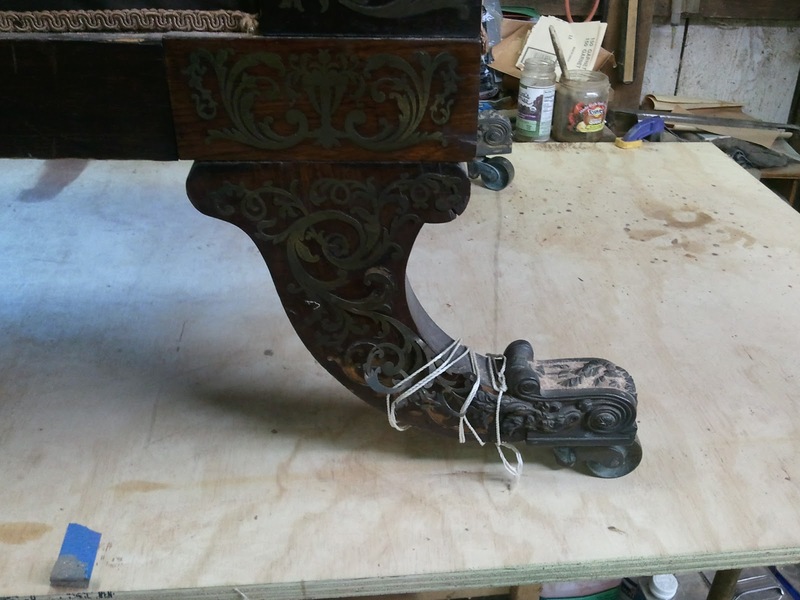 Feet get a lot of abuse from vacuums and feet passing by. 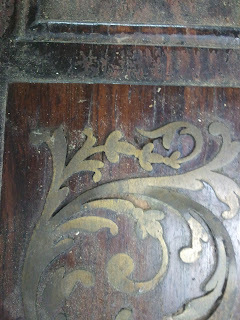 This photo shows the patches on two of the feet in a semi-carved state. they were later finished and touched up to match the existing finish. 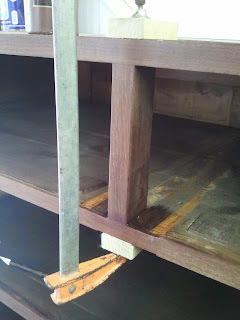 One of the drawer bottoms had become very warped and was beyond repair. I used the original as a template for the new one. 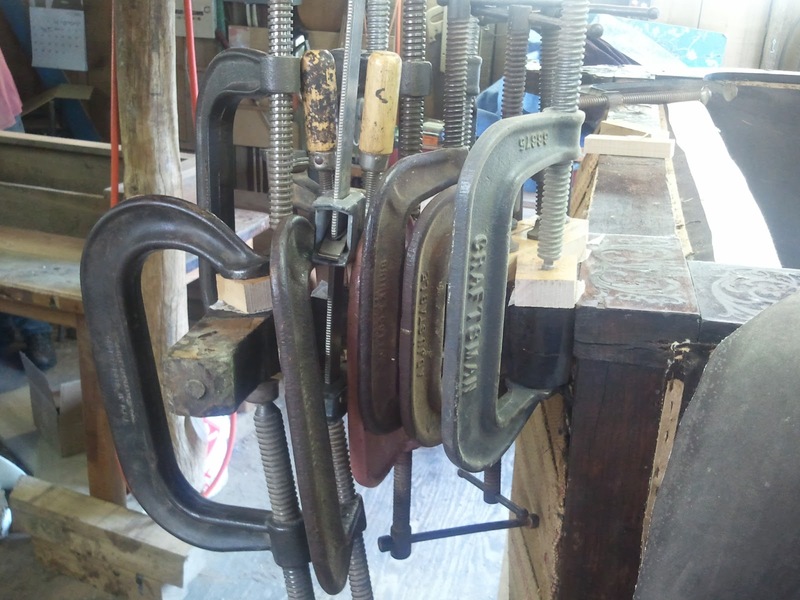 In order to do this I had to clamp the old bottom down to the new in several places in order to get an accurate tracing.This is seen in the photo below. 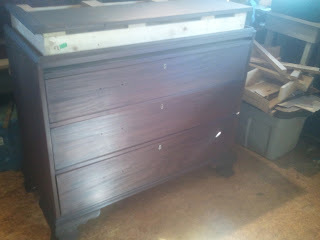 Below is a photo of the new bottom on the right next to the old drawer bottom on the left. 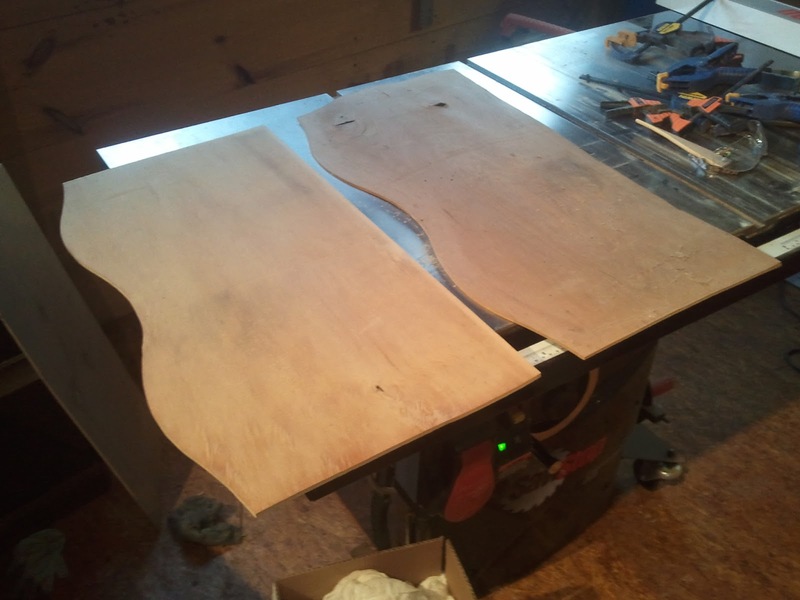 You can see the amount that the old bottom had warped. 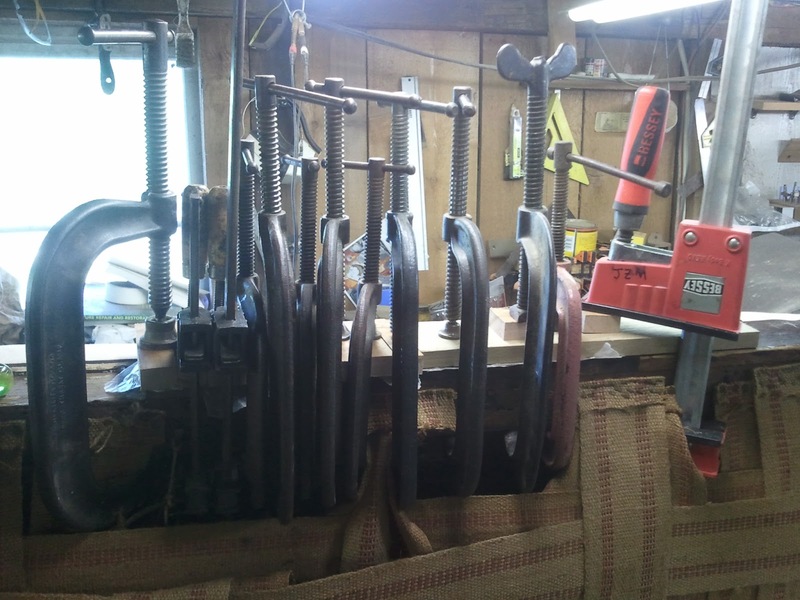 It had also become delaminated. 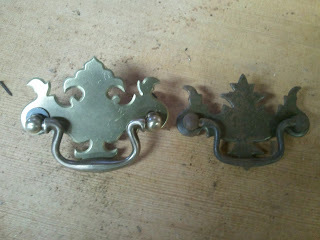 Below is a photo of the old hardware on the right next to the new hardware on the left. 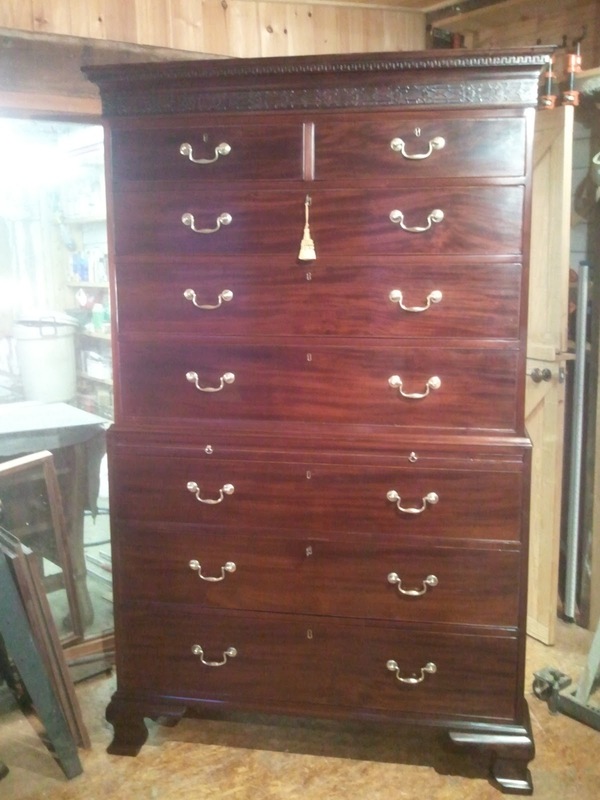 The new hardware was slightly larger and had a more traditional profile than the old. It was also made from solid brass rather than brass plated metal. 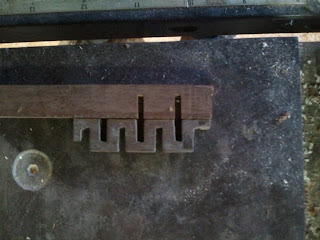 The old hardware was also pressed as seen below to give it the depth of brass hardware. 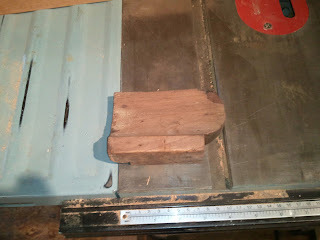 The next photo shows the back of the new hardware that was flat and not pressed. 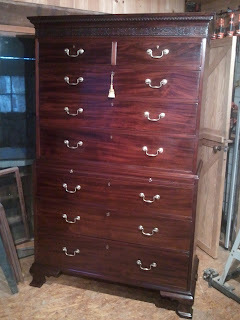 Overall, the new hardware was a nice addition to the piece. 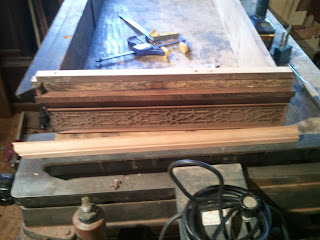 One last photo of the repairs was gluing down the lamination on the dividers for the windows. You can also see in this photo how warped the divider had become. 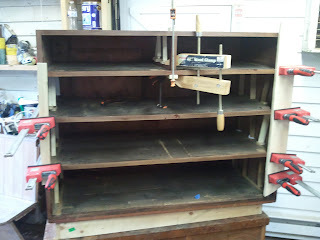 To deal with this, I reversed the dividers when I put them back in to flatten them against the glass. The next two photos show the completed desk. A recent piece that I restored was an English sofa made during the Regency period. 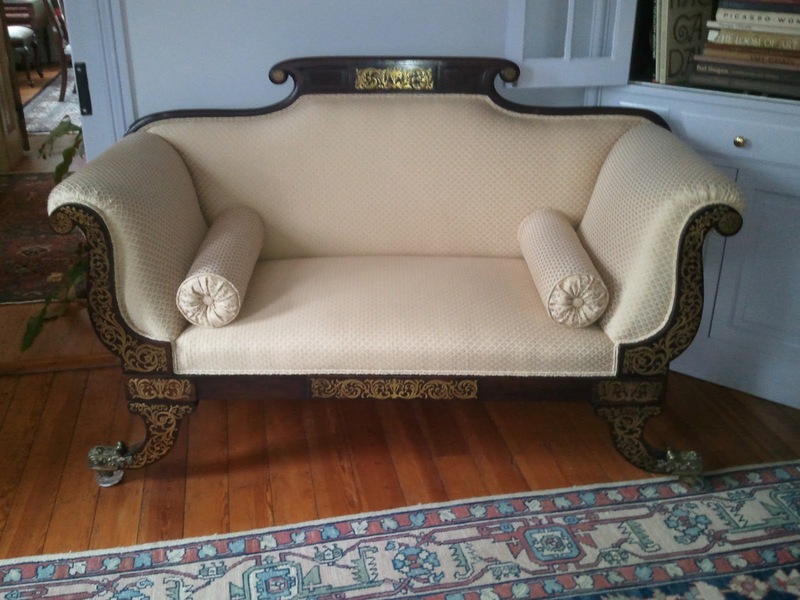 The sofa was made primarily of Beech and had Brazilian Rosewood veneer inlayed with brass in a process known as Boulle work, named after a French cabinetmaker named Andre Charles Boulle (1642-1732) who specialized in Marquetry and invented the process. The process employed in Boulle work is to layer a sacraficial piece of veneer with a piece of the primary veneer being used and a sheet of contrasting veneer or metal. 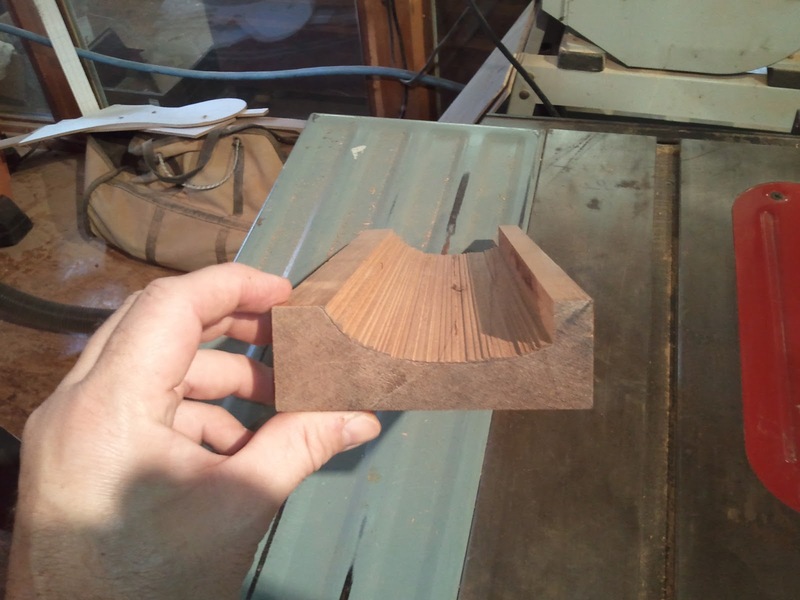 On top of these layers an image is applied. 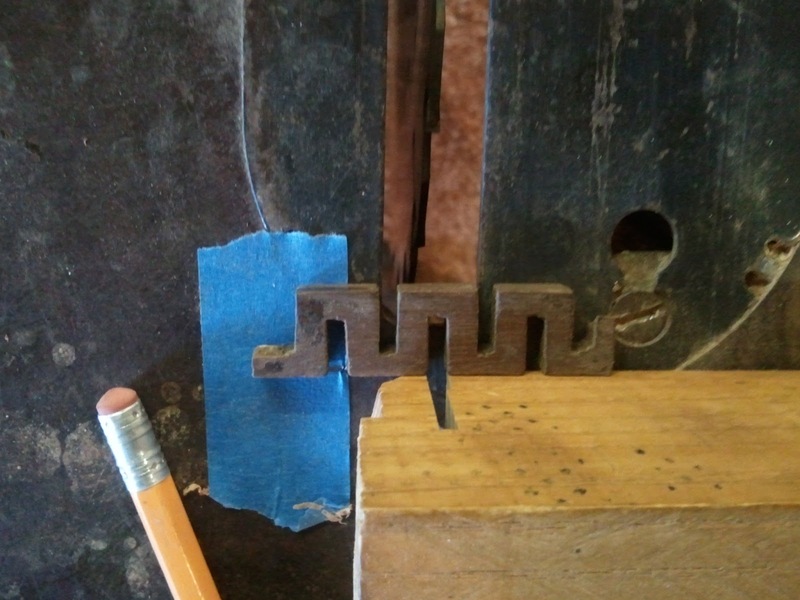 Using a fine saw, the layers are simultaneously cut through producing a piece of veneer with a positive and negative image as well as a piece of metal or contrasting veneer with a positive and negative image. 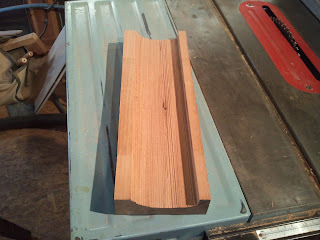 The image itself is sacrificed in the process and the sacrificial veneer is used to keep the valued veneer from splintering with the force of the saw. The cabinetmaker is then free to use the veneer as the image and the metal as the groundwork or to use the metal for the image and the veneer for the ground. In fact, pieces can be seen where one image is on the front of the piece and the reverse is on the opposite side. 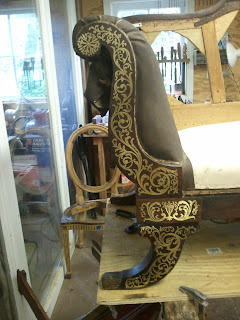 The difference between this and marquetry is that with marquetry, each piece is cut individually to create the image. During the time when this technique was first developed, examples were seen in silver and tortoise shell. The silver was sometimes also engraved. For most of the 18th century, this practice was out of favor, but it came back into use in the early 19th century in England and can be seen on pieces made during the Regency period. 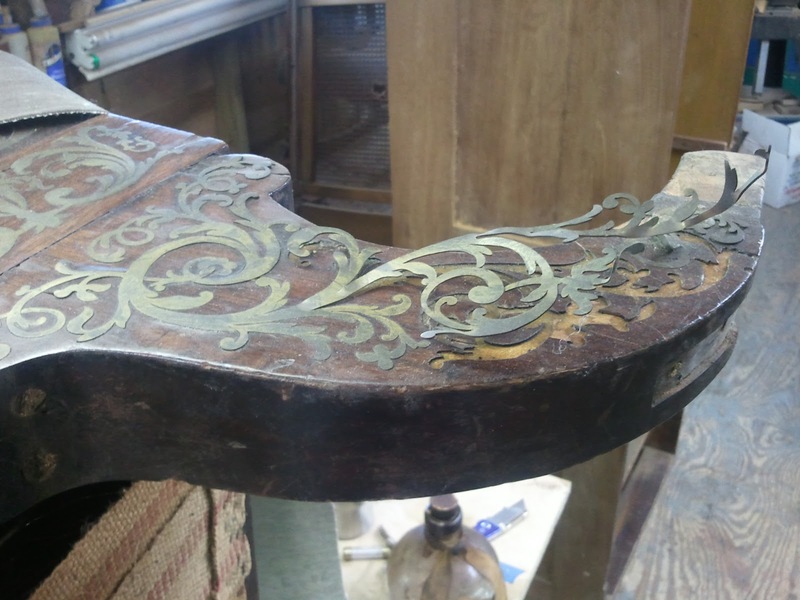 In most of these pieces from the Regency period, brass and Rosewood are used. 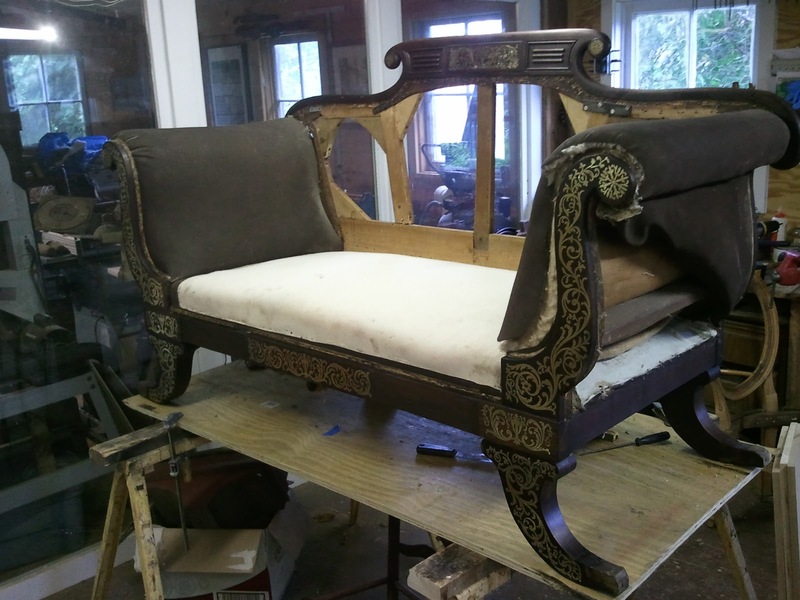 This is commonly seen in sofas as well as occasional tables and chairs. 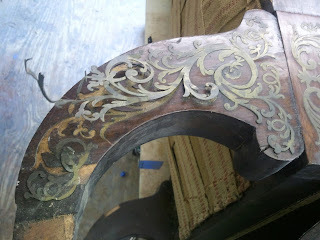 Most of the front facade of the sofa I worked on was covered in Boulle work. 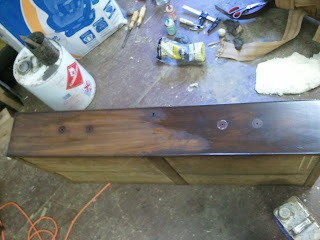 Where it was not covered, The primary wood (Beech) was stained and fauxed with India ink to simulate Rosewood. 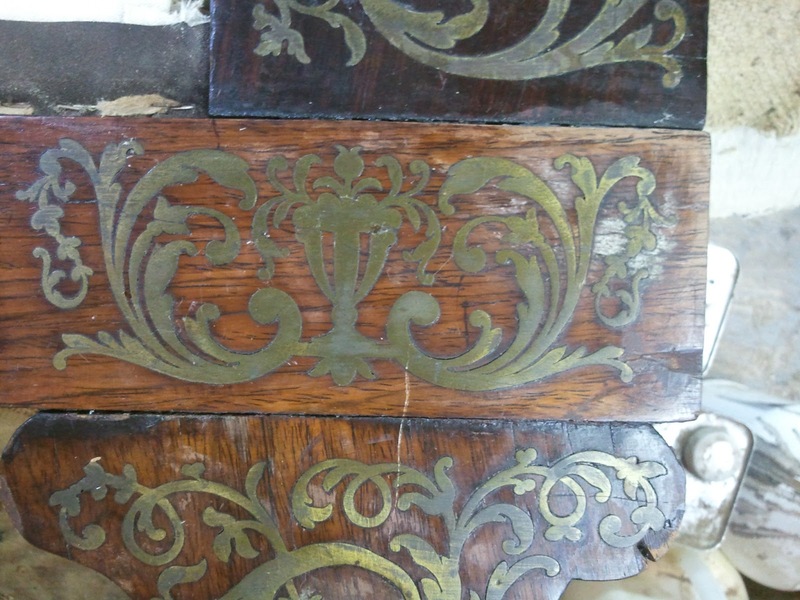 In addition to all of this, the feet were capped with cast brass casters that were extremely ornate and echoed the design of the Boulle work. Below is a photo of the sofa when it entered my shop. The central image on the veneer is seen in the photo below. 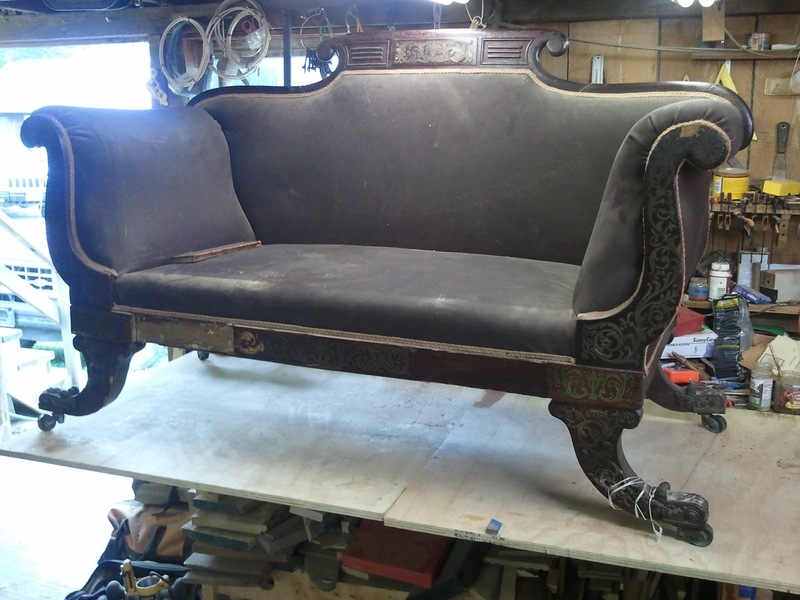 This was seen in four separate places on the sofa and was probably made all at once. 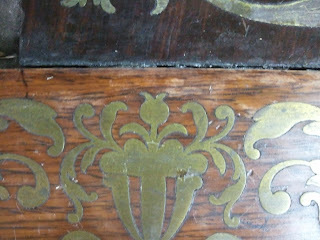 The image is a stylized plant growing around and out of an Urn. 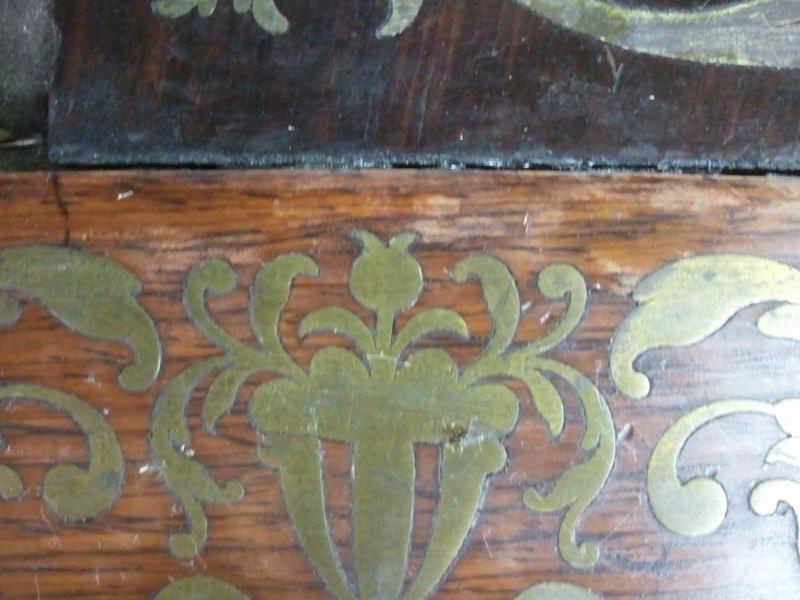 The urn is a commonly used symbol in neoclassical furniture forms. 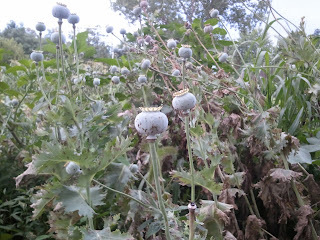 While walking through a friends garden, I realized that the plant in question was a Poppy plant. 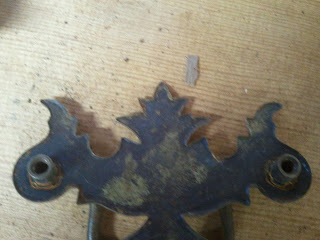 Once I looked at the image closely, I could see the seed pod in the center of the image flanked by the serrated leaves. 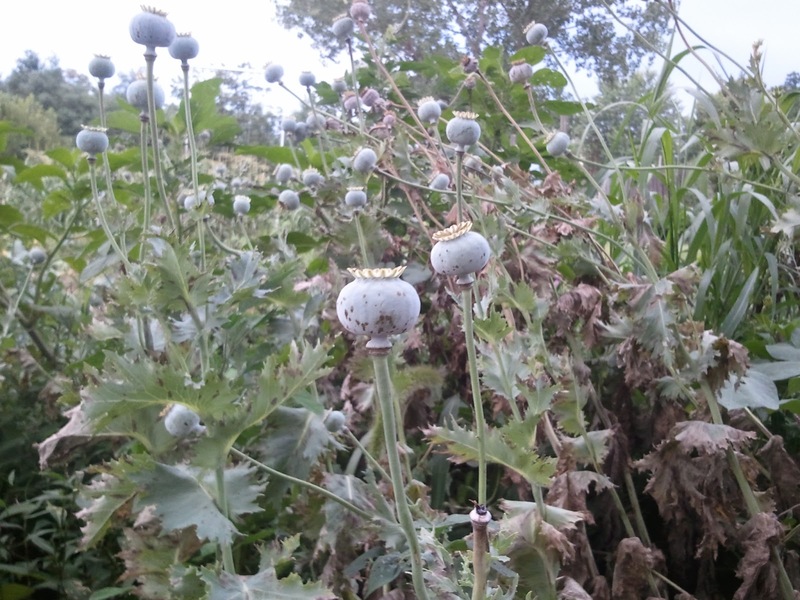 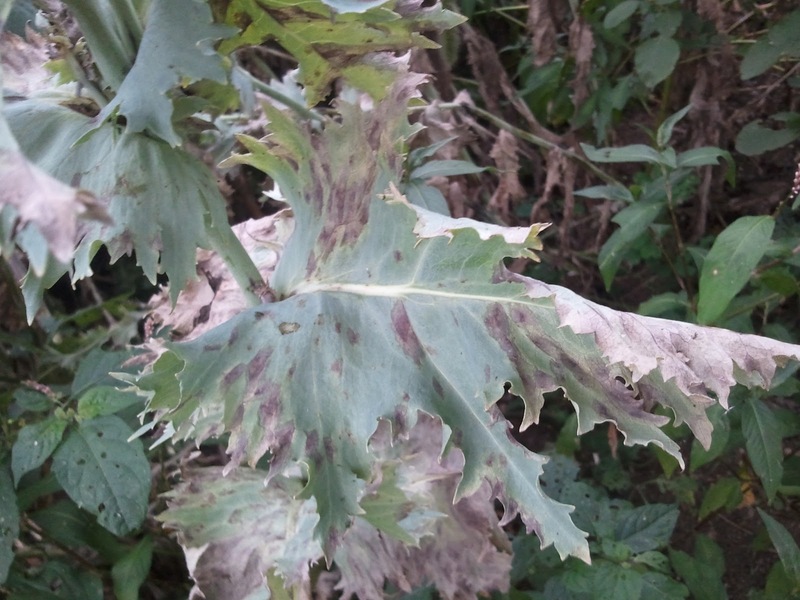 Below is a close up of the seed pod followed by some poppy plants showing their seed pods and serrated leaves. The piece had some veneer loss as well as some missing brass. 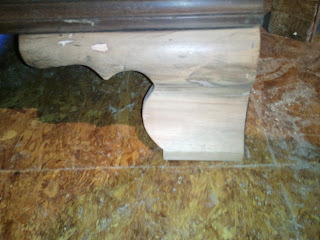 In addition to this, the finish was in really rough shape and the joinery in the back and in the feet was loose. 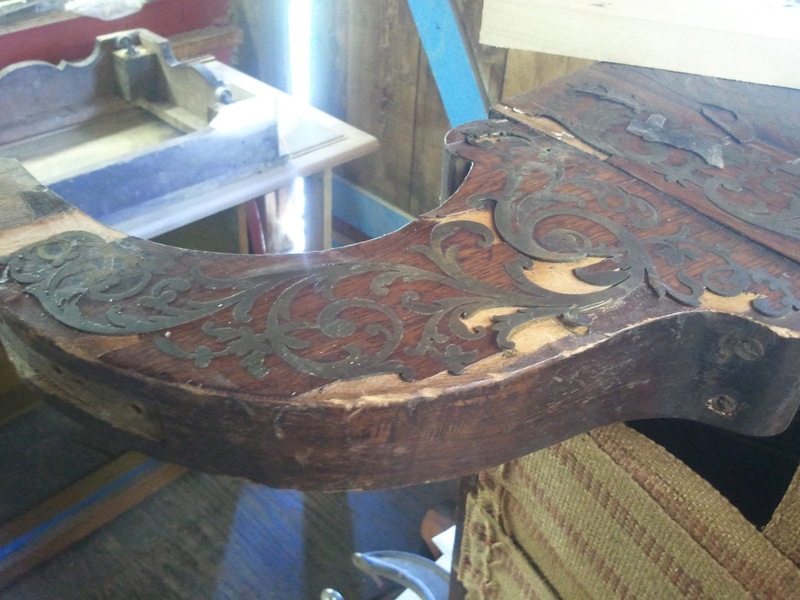 One other major problem was that the brass casters had completely seized with corrosion. Below is a close up of one of the casters and the brass inlay held in place with some string. This photo shows a veneered board that was applied to the skirt of the sofa completely dislodged from the sofa. The next two photos show some of the brass lifted from the leg. 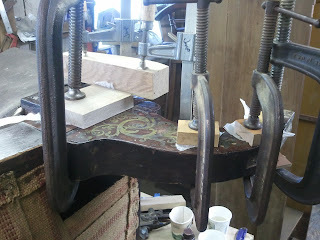 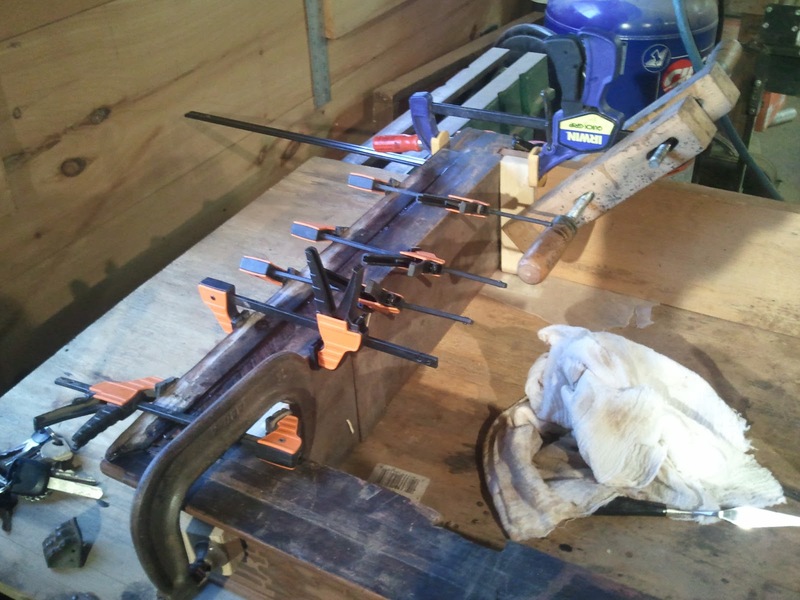 The many photos that follow show the process of checking for loose veneer or brass, lifting it to clean the old glue beneath it, and clamping it back in place with new hide glue. The hide glue takes about 24 hours to really dry, so there were many clamping sessions that went on for several days. 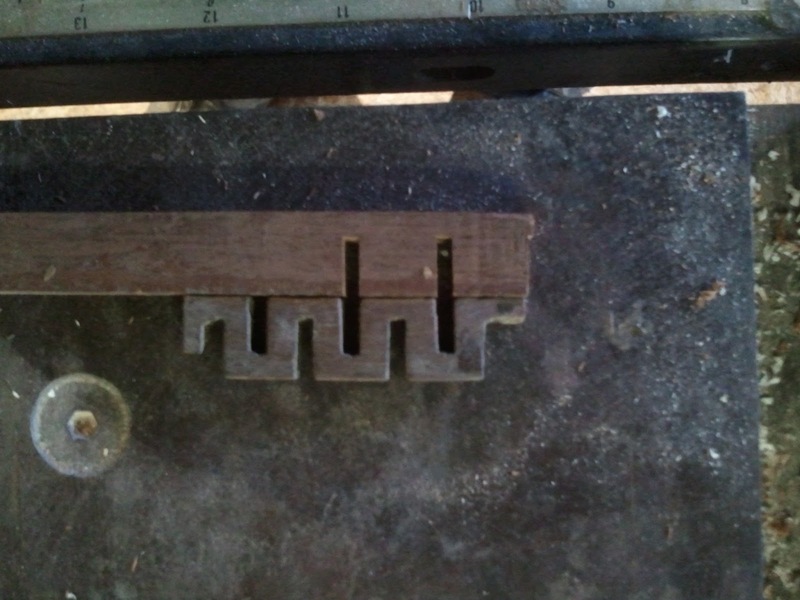 On the opposite side of the image was the same piece that was missing in reverse. 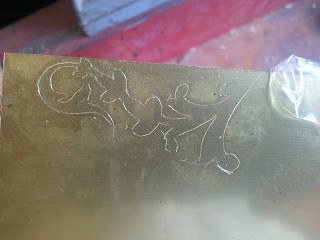 The piece was lifted so I was able to slide a piece of brass sheet below the original and, using an X-acto knife, trace the image onto the new brass. 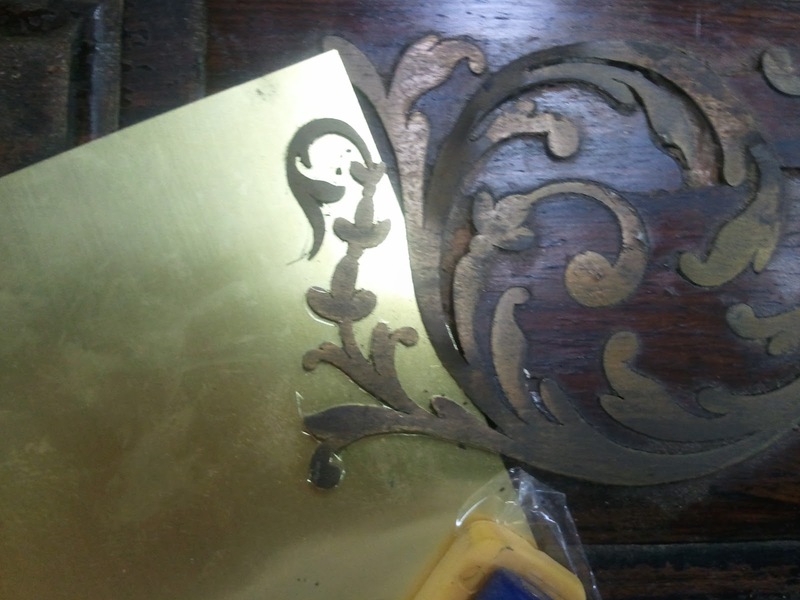 The image was then cut out and reversed and fit into the area that the brass was missing. 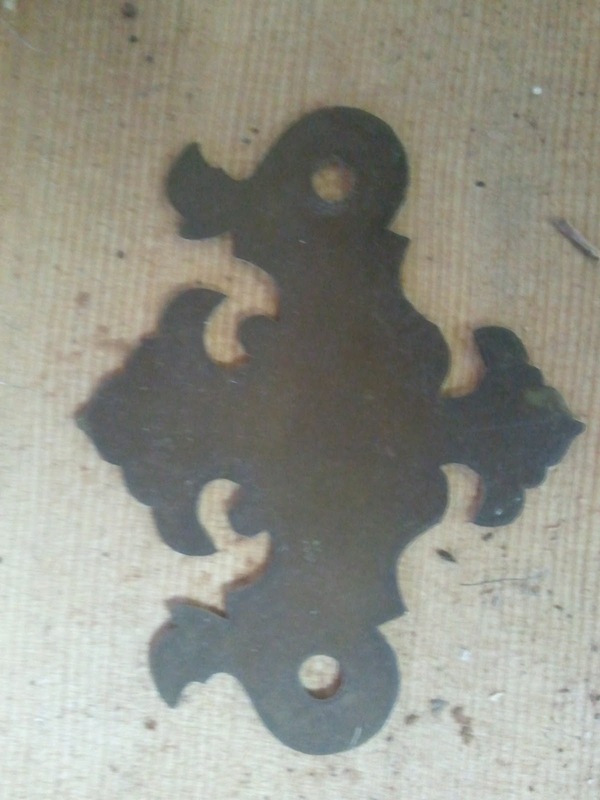 The completed image is seen in the last photo. Apologies for the flipped photos in this section, but you get the idea! This photo shows the brass work and veneer above being glued in place. The back of the sofa is a separate frame held in place at the bottom with tenons and at the top with screws. 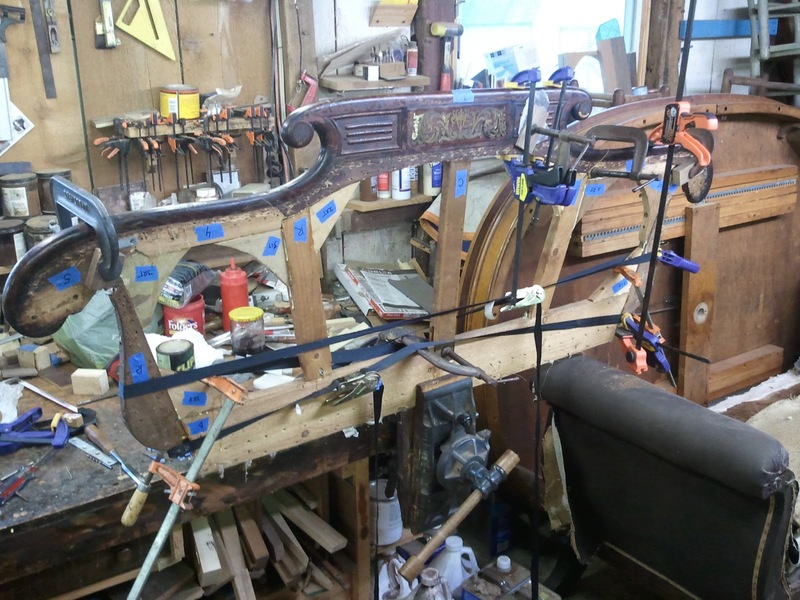 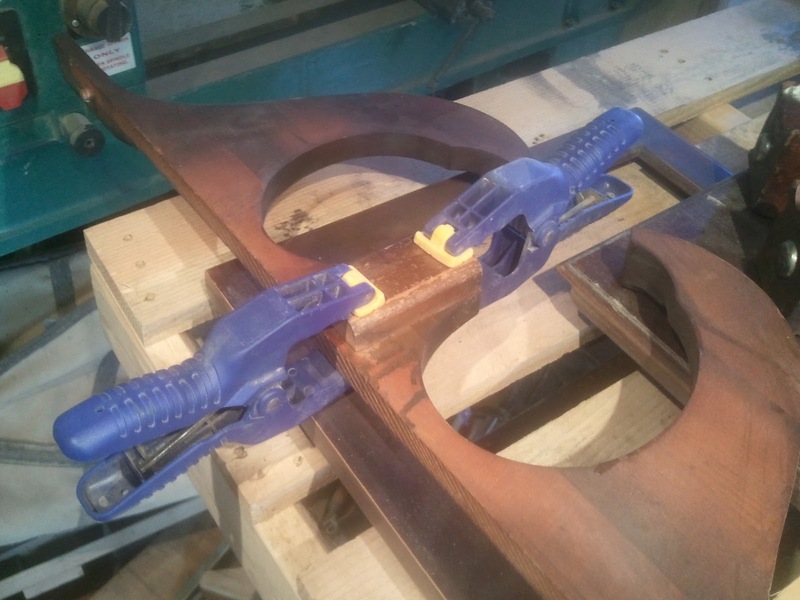 This is to allow the upholsterer to upholster the seat. 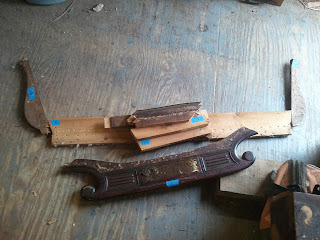 The joinery on the back of the sofa was very loose. 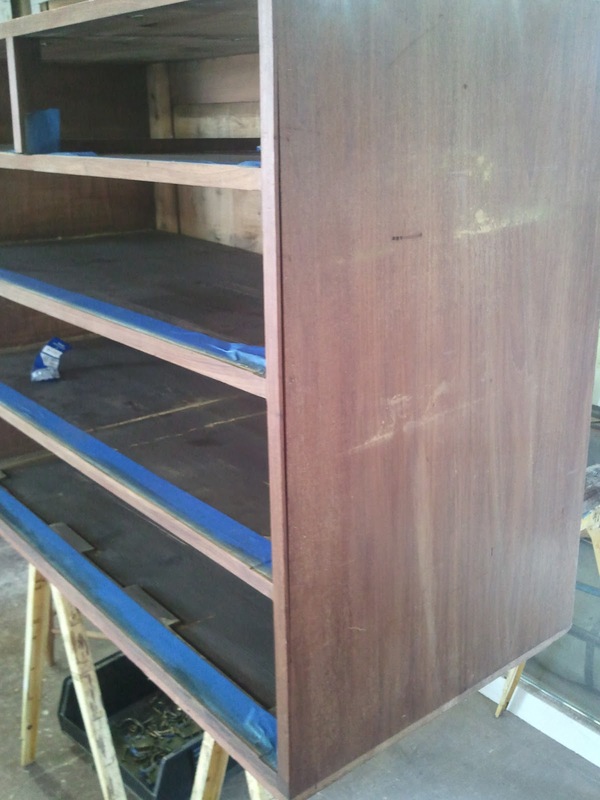 In the photo below you can see the back with each piece marked with blue tape to indicate the orientation and the position of each piece. 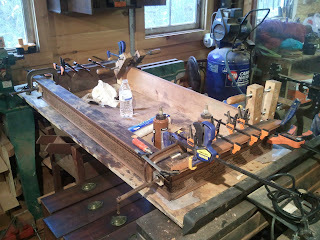 The back was then disassembled, The glue was cleaned, and the back reassembled. This process is shown below. Once the repair work was completed, I turned my attention to the finish. 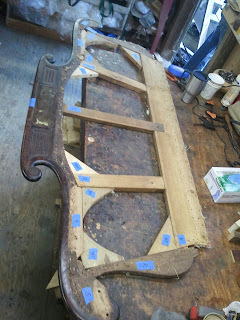 The finish was in bad shape and really needed to be stripped. The danger in this was that the Beech wood had been fauxed with India ink and I did not want to loose this. 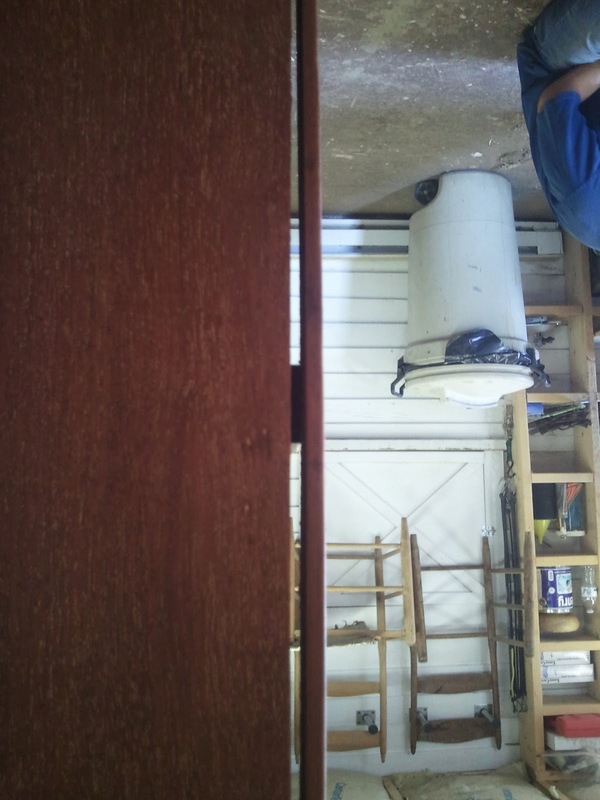 The finish was a shellac based finish and the solvent used was alcohol, so I used alcohol to slowly smooth out the original finish and reverse the damage done to the finish. The result was a finish that was very thin and needed new finish to be added to it. The other result was that the India ink was preserved. 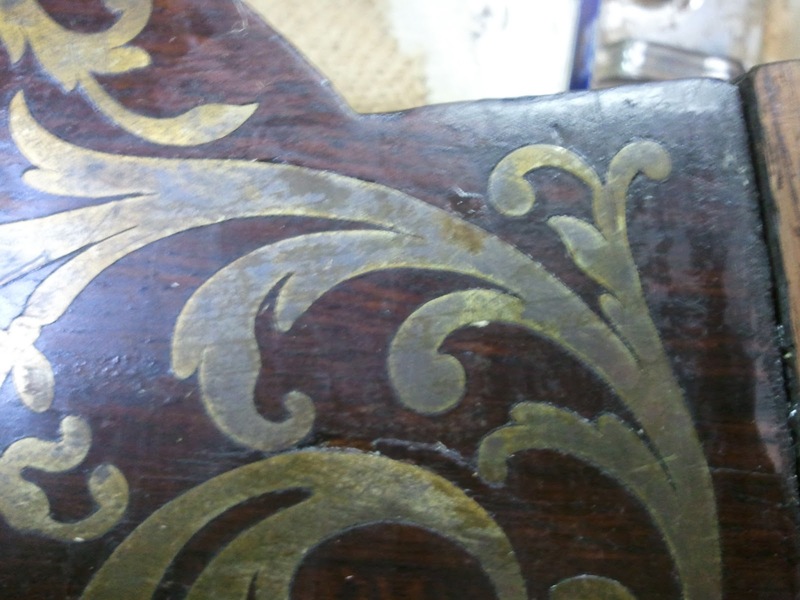 One other piece that came out of this was that the finish was removed from the brass and the brass was brightened to contrast the Rosewood. From there it was just a matter of coating the sofa with new finish and waxing it. Here are a few images of the restored finish before the sofa was sent to the upholsterer. Below are some photos of the sofa back from the upholsterer. The fabric was gold in color and picked up on the brass quite well. 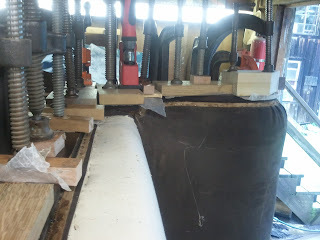 The upholsterer also made Bolster cushions for the sofa, seen in the last photo. The result was a stunning sofa that in my opinion was really worth the effort put into it. 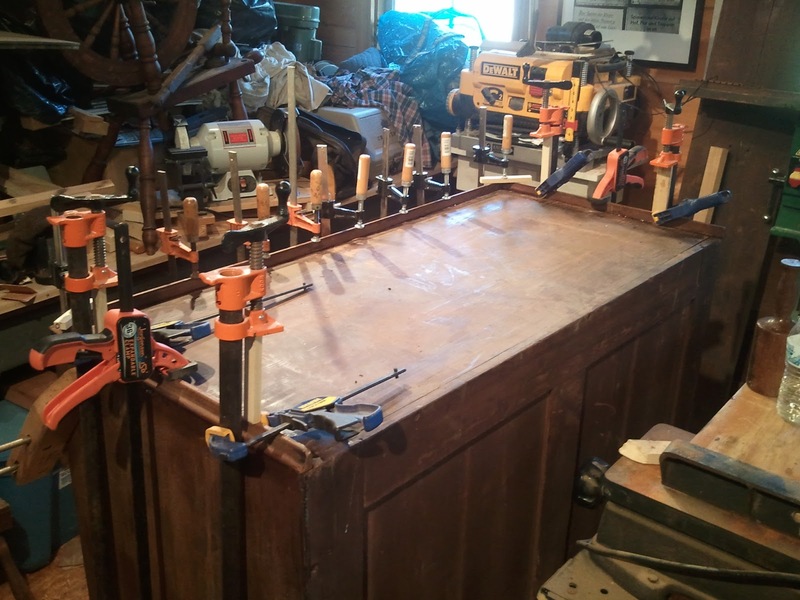 This post concerns the restoration of a Mahogany chest on chest I recently restored. 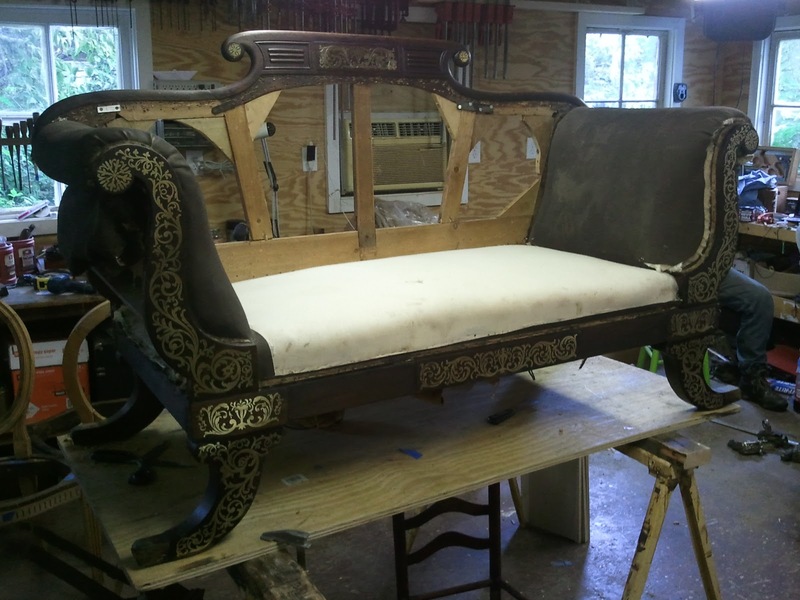 The piece is from the British Isles and dates to the second half of the 18th Century. 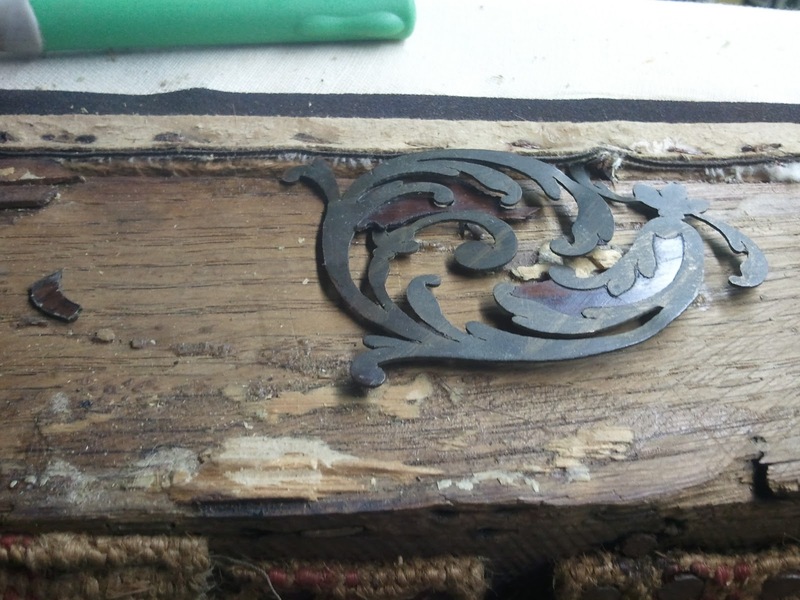 I have a suspicion that the piece may have been made in Ireland or Scotland, but it is safe to say that it was in the style of British manufacture. As far as Chest on Chests are concerned, this was a really nice example that had suffered several bad restorations in its time, but more on that later. The top half of the chest is capped with a cornice containing dental molding above a well executed frieze displaying patterned blind fretwork. 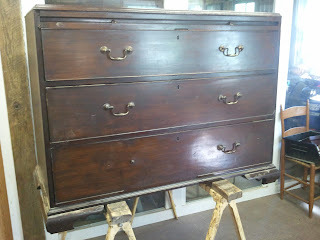 Below the cornice the upper half of the chest has two short drawers above three long drawers, each graduating in size by 1 inch. 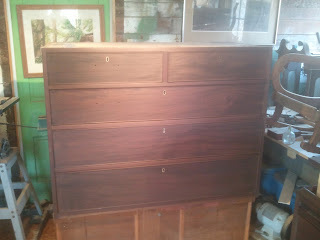 Above the three graduated drawers on the bottom half is a brushing slide (a sliding shelf used to dust garments). Below the lower three drawers are four robust ogee bracket feet. 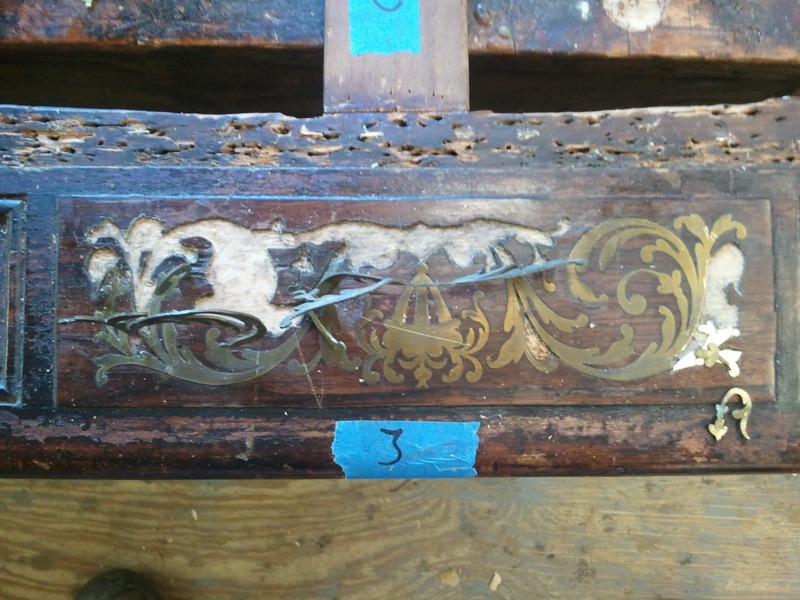 Besides the well executed ornamentation on this chest, the sheer size of it is sure to impress the viewer. 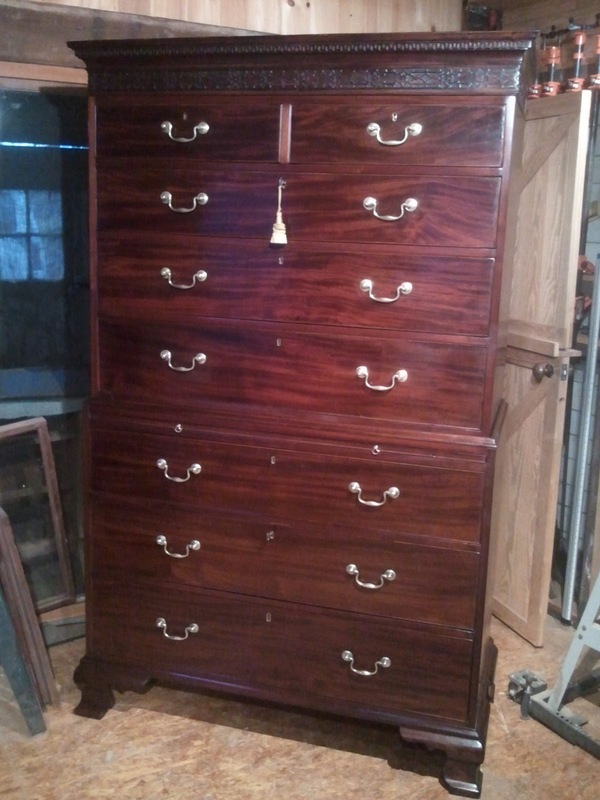 This was a chest made to impress and was made for someone who not only had a lot of clothes, but also a lot of money! 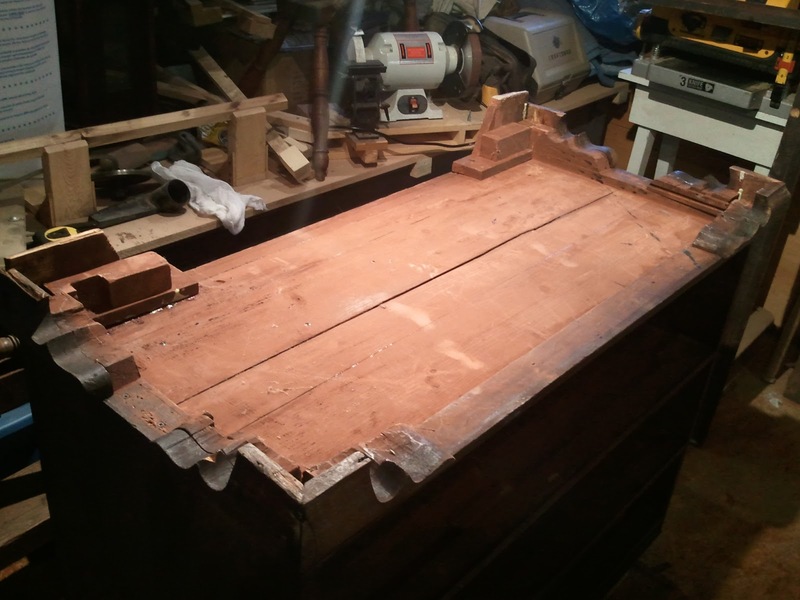 The condition of the chest when it was presented to me was quite bad, with many repairs needed and a complete replacement of the finish. This last part I did not take take lightly, and tried first to remove some of the over finishing that had been done in the past, but once I got to the base finish I realized that it was a Lacquer that had yellowed in the pore of the chest, making it necessary to completly remove the finish and start from scratch. 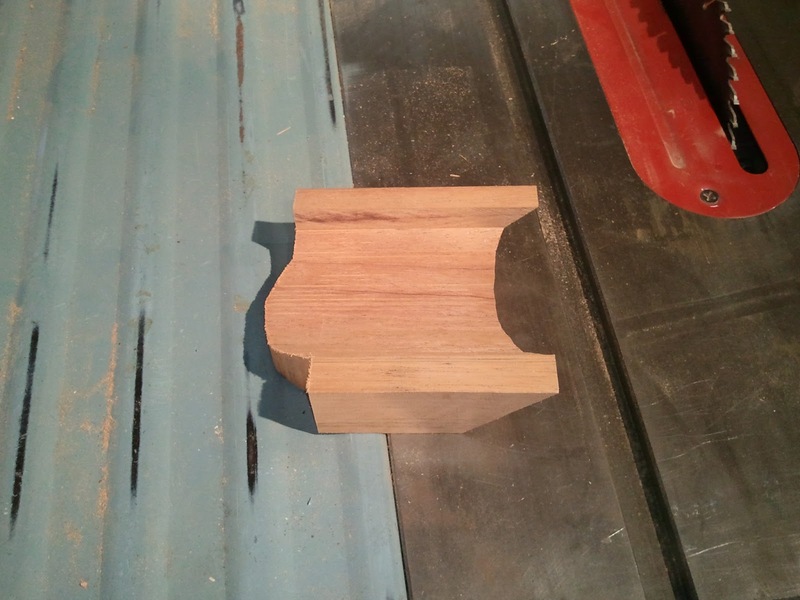 Below is a photo of the top followed by a photo of the bottom half. This is what the piece looked like when it came to my shop. 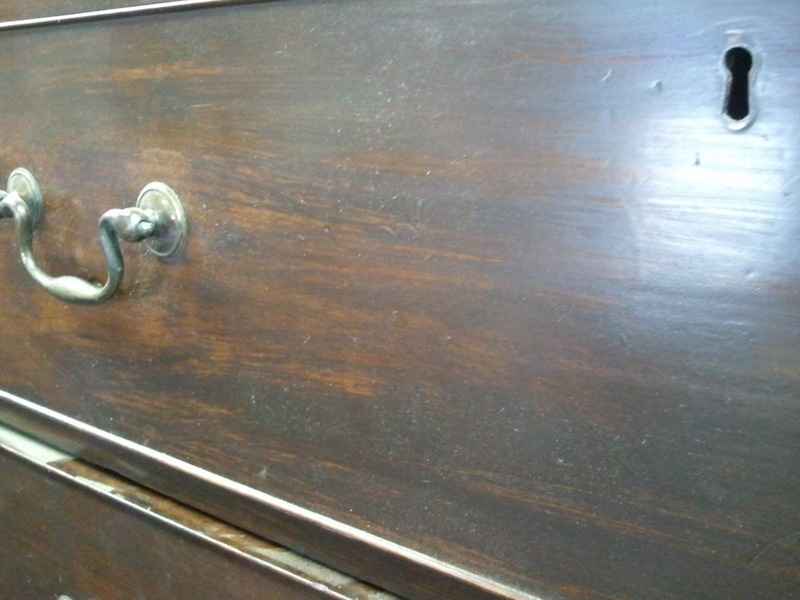 In this next photo, you can see the wood coming through the darker opaque section of the over finish, It was as if someone has smeared brown paint on the surface of the chest. 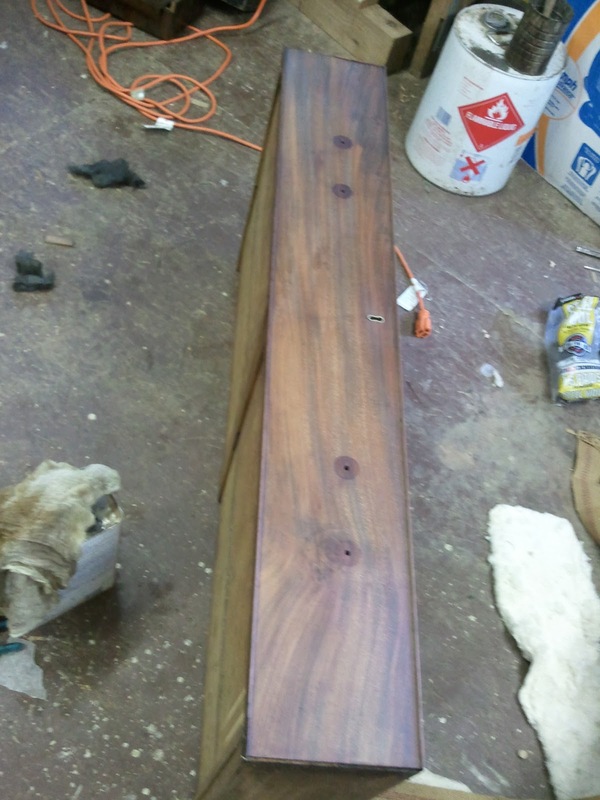 The yellowish tint beneath the brown smear turned out to be the yellowed Lacquer finish. 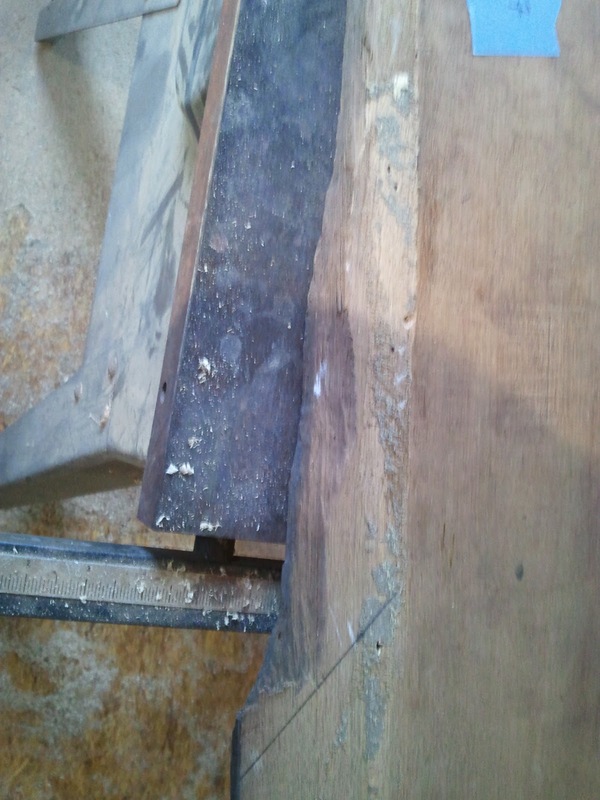 This next photo shows the finish being removed, with the bare wood coming through. The following photo shows the same drawer with the finish removed. after the finish was removed, the repairs began. One particular repair that happens in a chest like this is that the board which covers over the dovetails for the drawer dividers becomes pushed away from the sides. 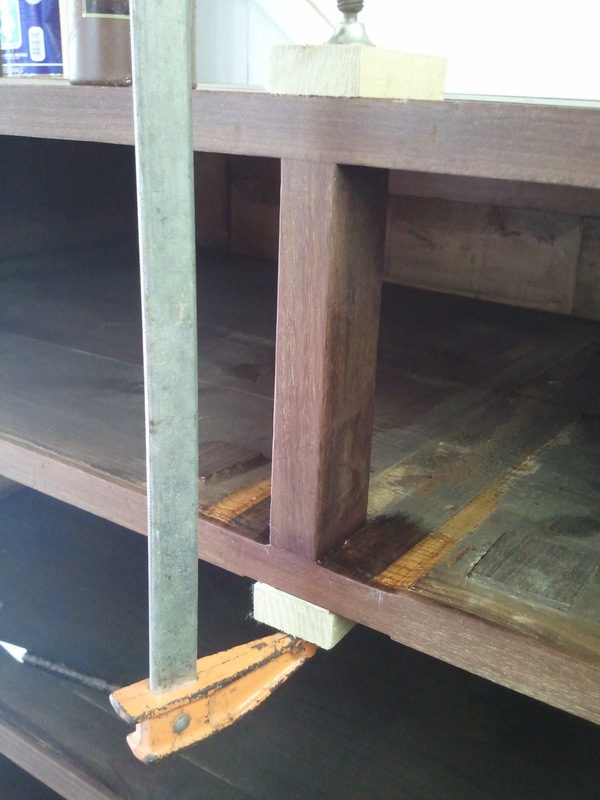 The photo below shows this and the following photo shows the gap created in detail. 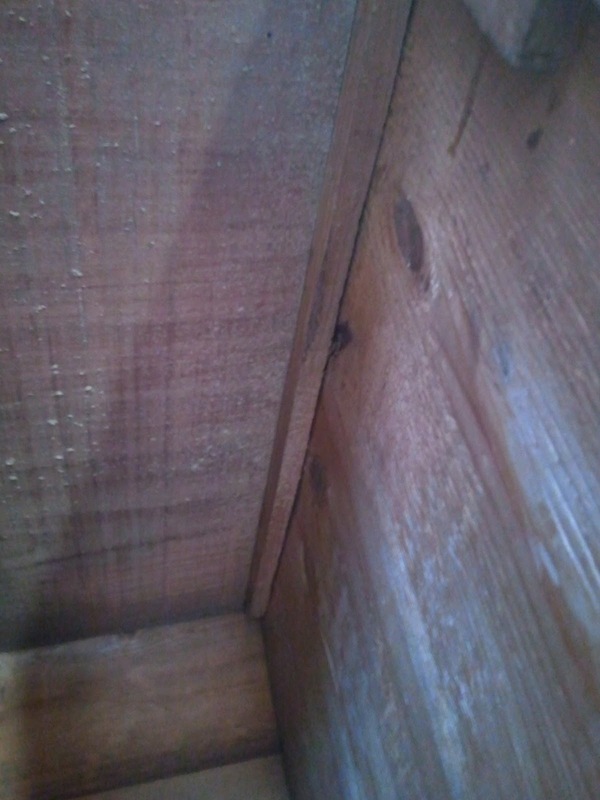 This gap is caused by the sides shrinking over time. There are boards which are laid across the grain inside the chest which guide the drawer as it moves in and out. 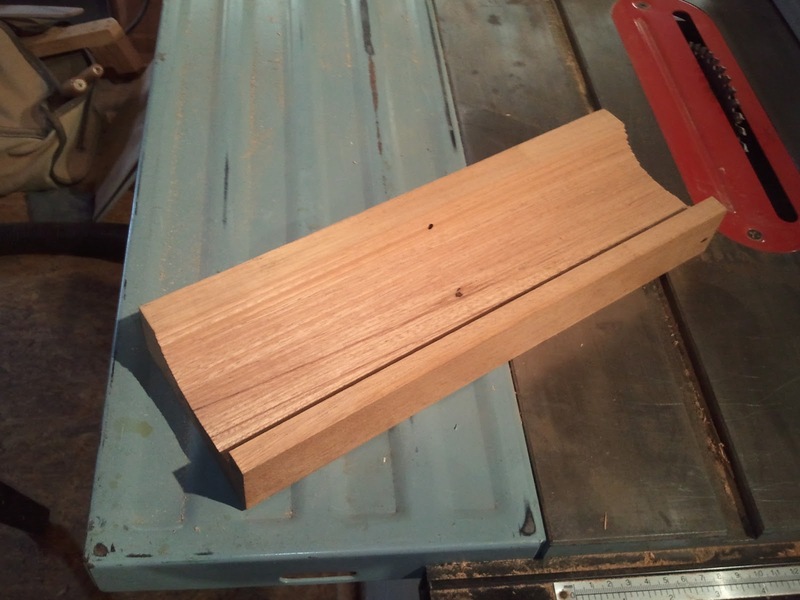 Since these boards are running perpendicular, they do not shrink, and they push out against the dovetail cover, causing the separation. 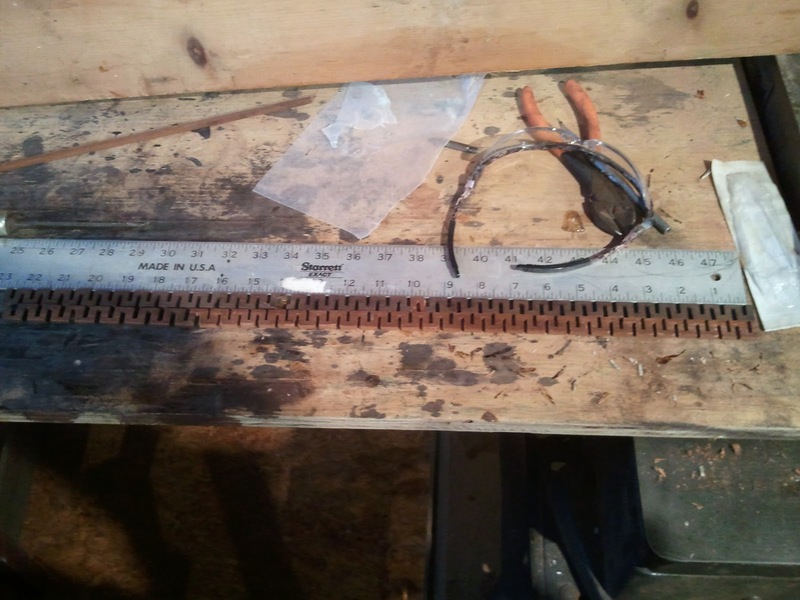 Below is a photo of one of the problem boards. 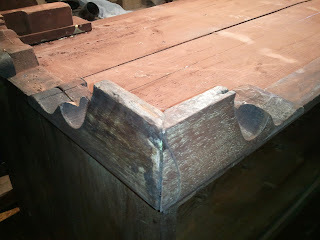 The drawer guides were each removed and cut down so that the dovetail covers could be glued back in place. 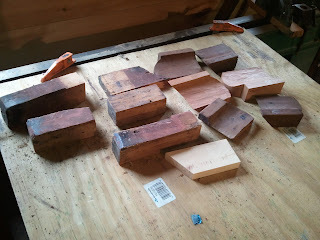 Once they were cut to size they were reattached. This next photo shows the divider between the short drawers being glued. This photo shows the guides mentioned before trimmed and laid out for reattachment. 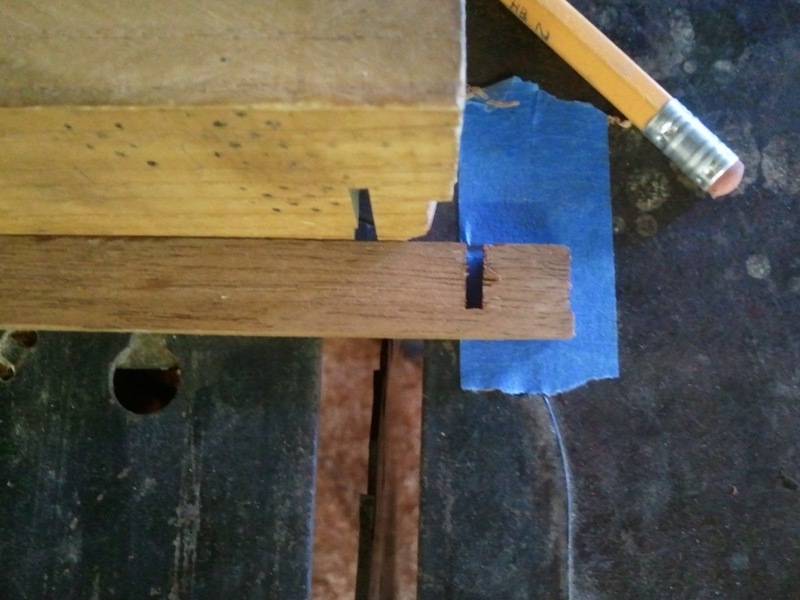 To glue the guides in place, short pieces of wood were wedged in place to hold the guides as the glue dried as seen in the photo below. 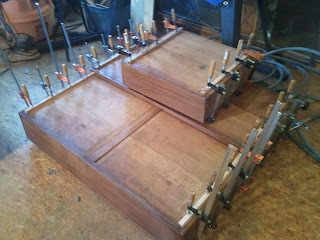 This photo shows the board which guides the short drawers from moving side to side being glued in place. 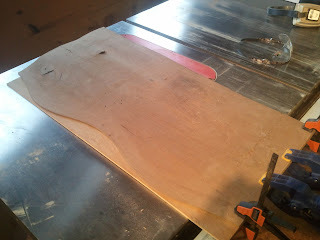 The process for holding the board while the glue dried was the same. After all of the close ups, I thought it would be good to offer a shot of all of these repairs being made. 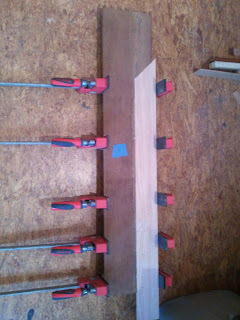 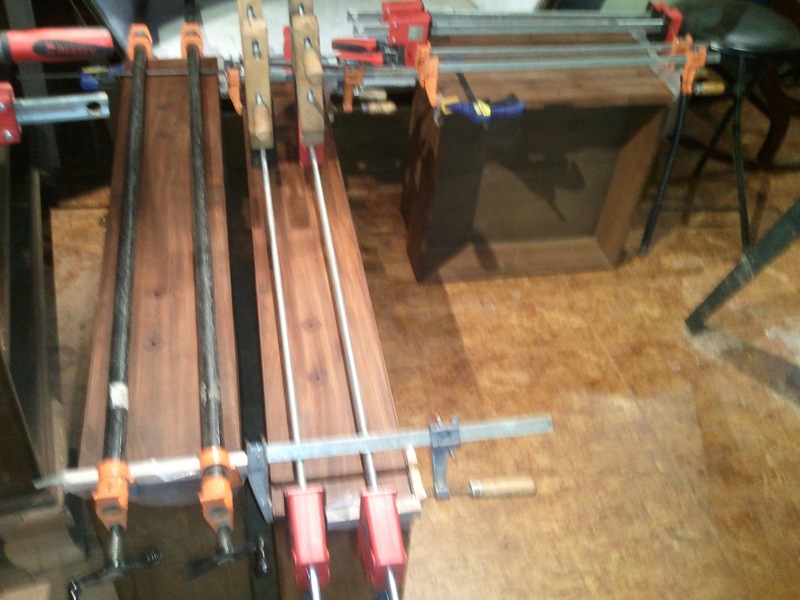 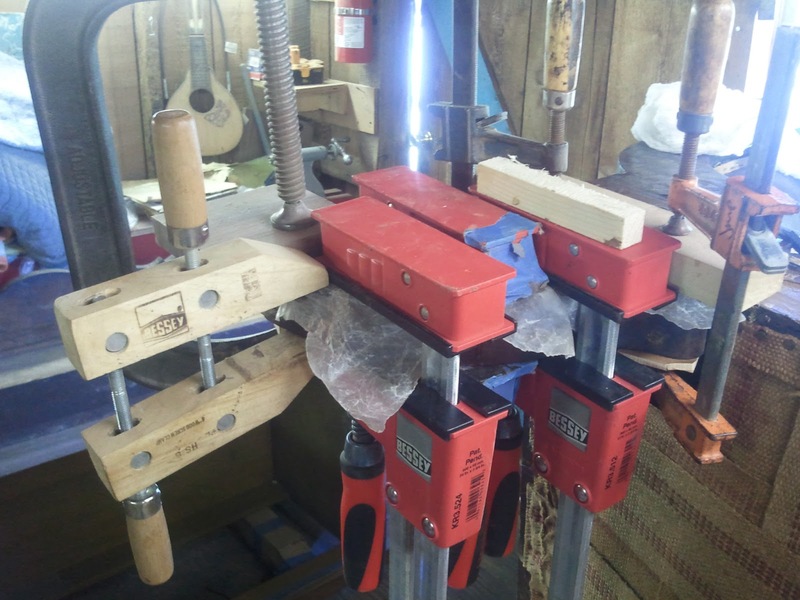 The red clamps on the sides are holding the dovetail covers in place as the glue dried. 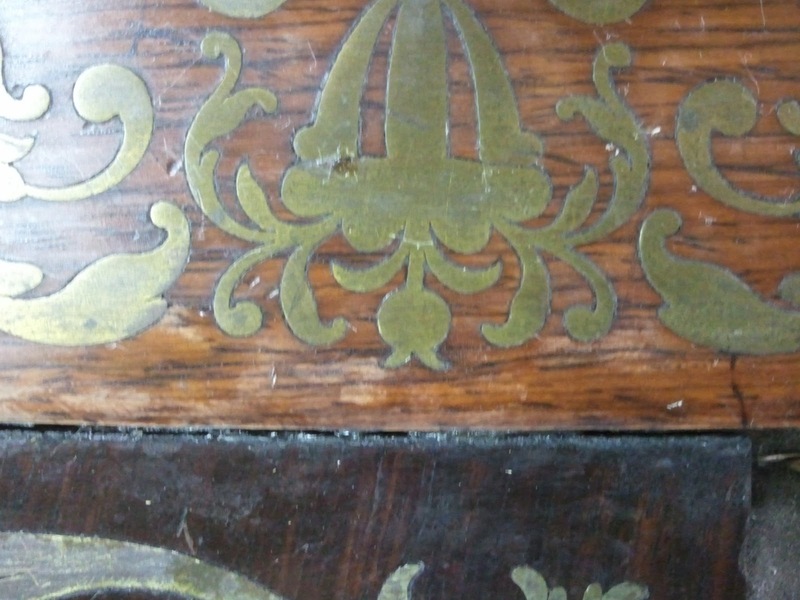 Similar repairs were made to the bottom case. In addition, the feet on the bottom case needed to be reattached where they had broken. 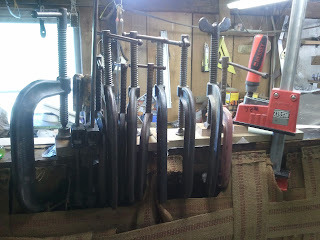 Two sections of the broken feet were missing and needed to be made. To cut the ogee profile on the feet, I used the table saw to create the cove and refined it with chisels. Below are some photos of the cove after it was cut on the table saw. These next two photos show how the feet remnants were still attached to the case. 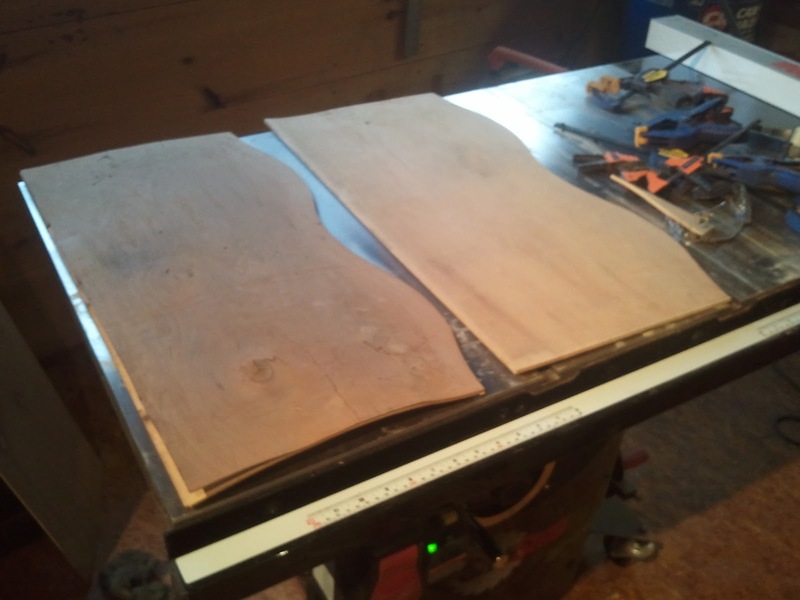 The photo which follows shows all of the broken sections from the feet ready for gluing, including the two portions I made. 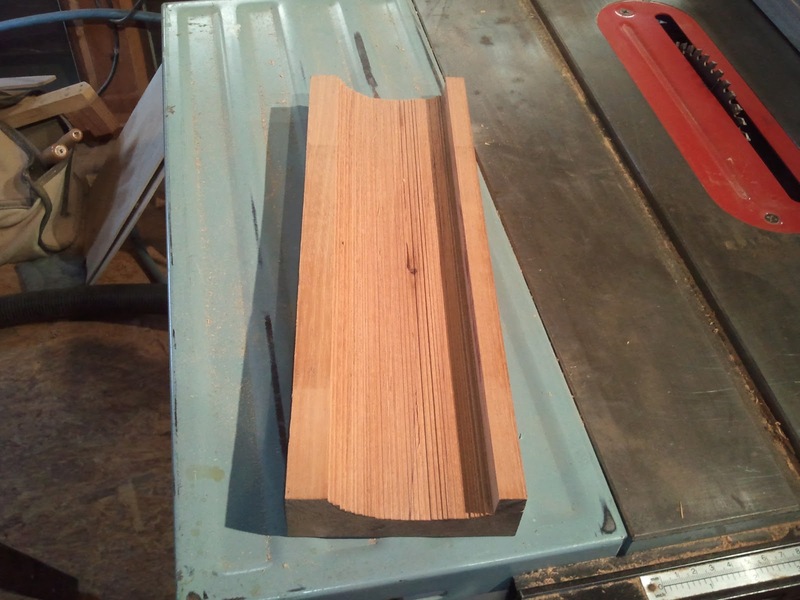 These two photos show the portions I made. Further refinement was made to each foot once the pieces were attached. 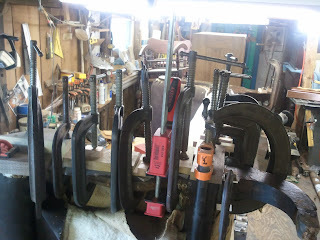 This photo shows the broken sections of the feet being reattached. The next two photos show the new sections I made attached to the feet and refined. 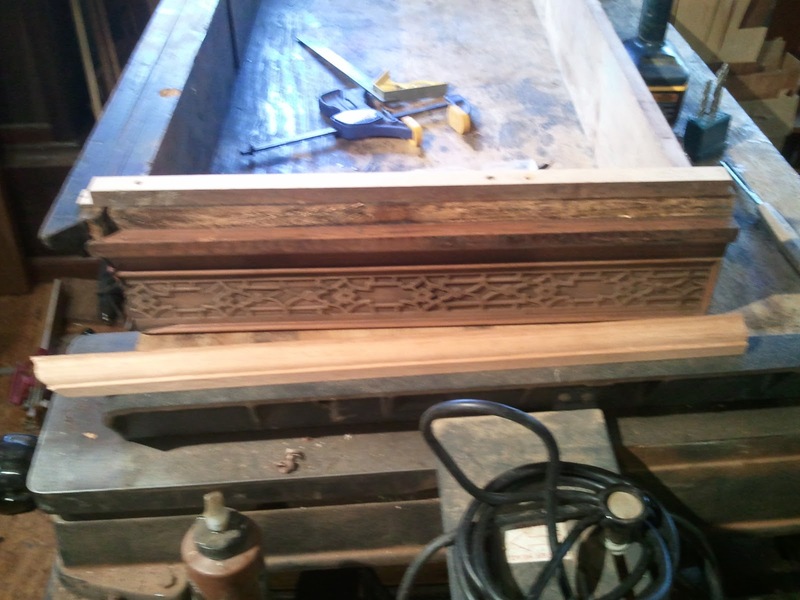 The cornice had several pieces of missing molding and also many loose pieces of dental molding and blind fretwork. I made the missing molding using an existing section and attached the new section. This can be seen in the three photos below. 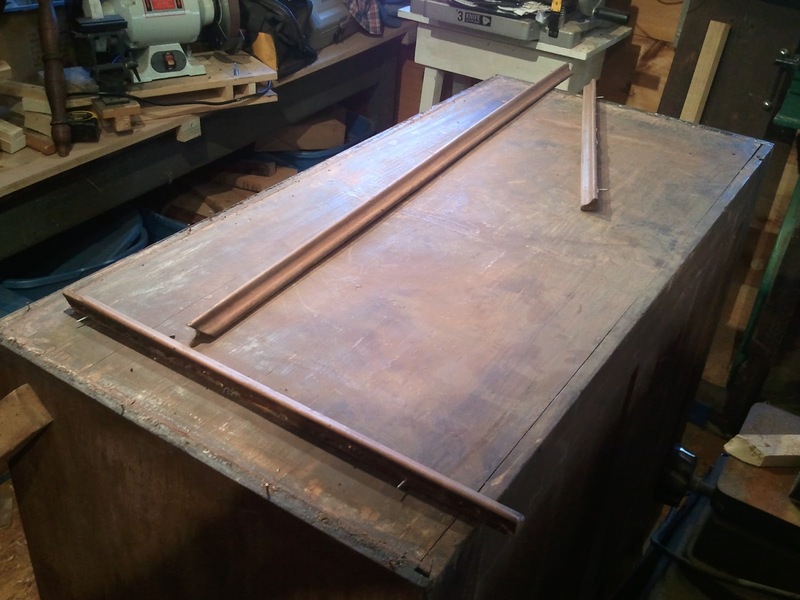 I also attached a board I made to replace the missing back board that completed the fourth side of the cornice. 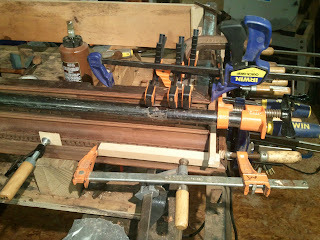 This photo shows gluing the molding on the opposite side. There were many feet of dental molding missing from the cornice. To make new molding I found that the thickness of my table saw blade was identical to the kerf in the molding. 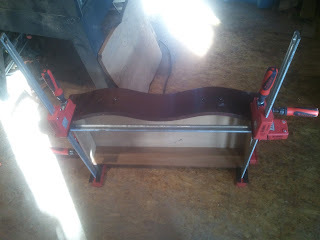 I used a backer board on a cross cut sled and cut into it to use the kerf as a guide. 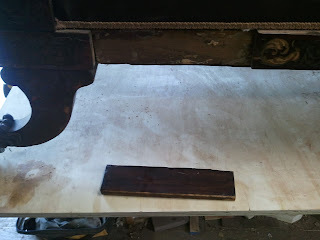 A piece of the old molding can be seen lying in front of the backer board in the photo below. 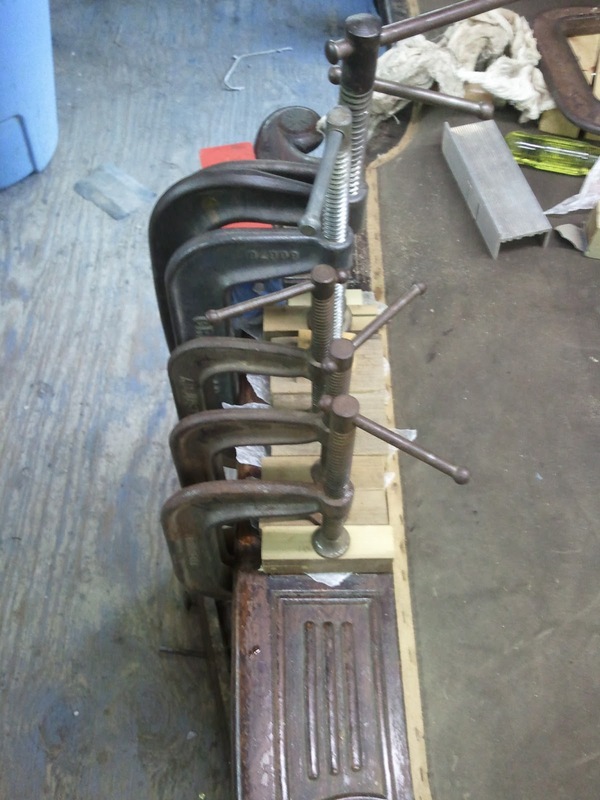 The kerfs are lined up. The blue tape to the left is set to where the edge of the next kerf is in the molding. 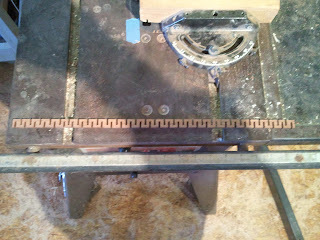 by advancing the kerf I just cut to this blue tape line, I was lined up for the next kerf. 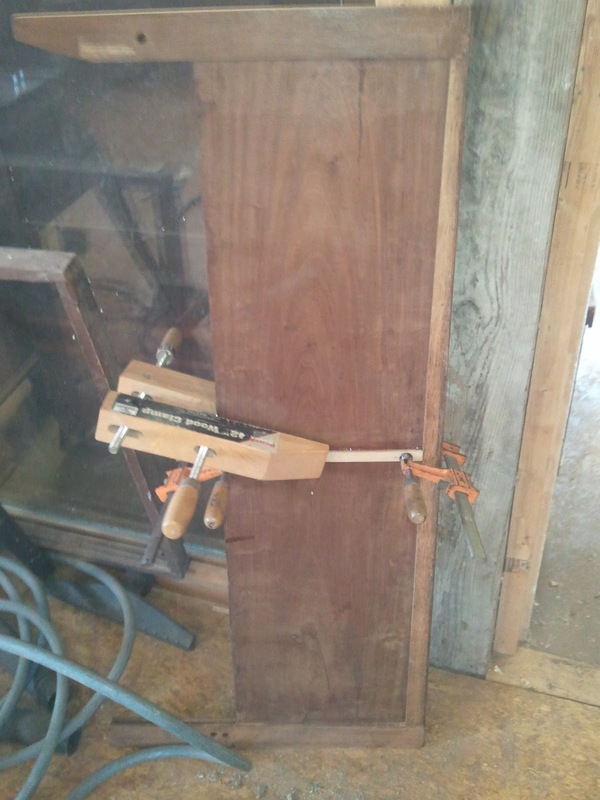 The rest of the procedure was pretty mechanical. 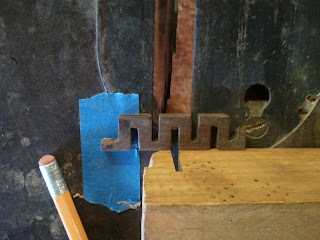 This shows my new piece with the initial kerf lined up with the blue tape and ready to cut the next kerf. 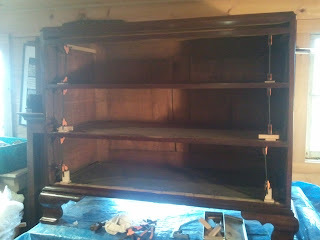 I should point out that in these photos I have the molding lying on it's side for clarity. 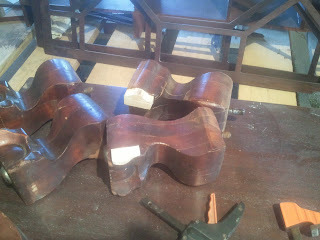 The kerfs were cut with the molding standing on edge. 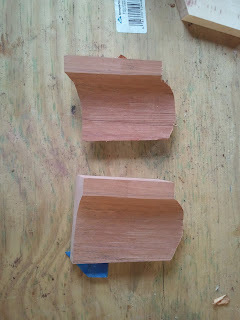 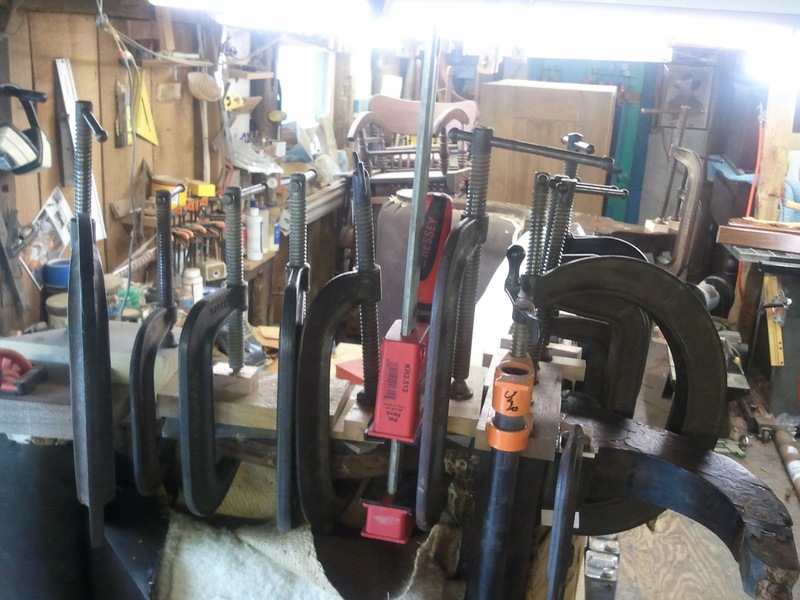 Once the first side was cut, the molding was flipped and the second set of kerfs were cut between the first. 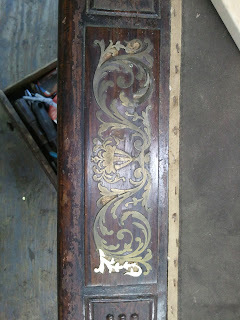 Here is a finished piece of pierced dental molding. 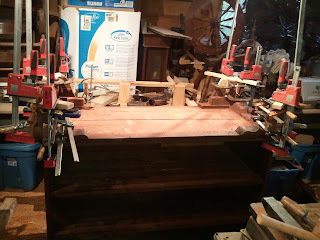 This photo shows the new section along side the old. 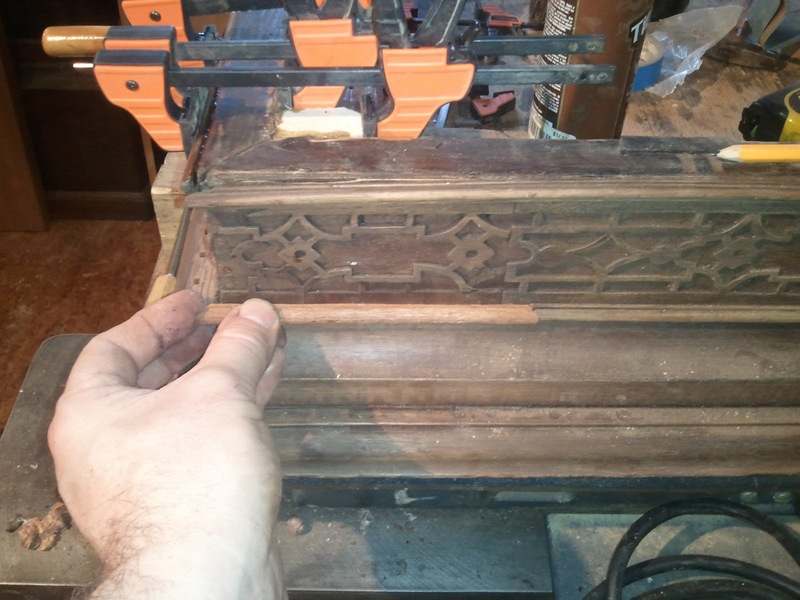 The new molding is below the old. A stray photo, this shows a piece of missing beading that was replaced. 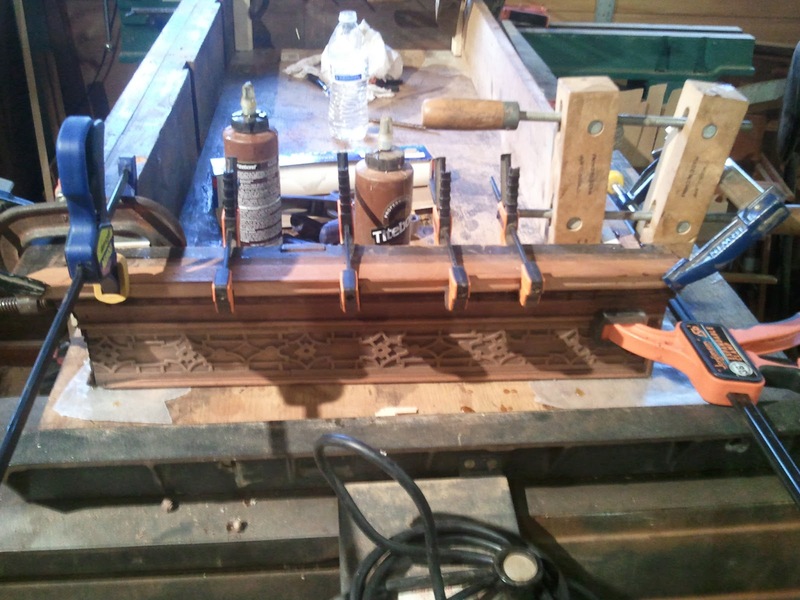 The beading surrounds the blind fretwork. 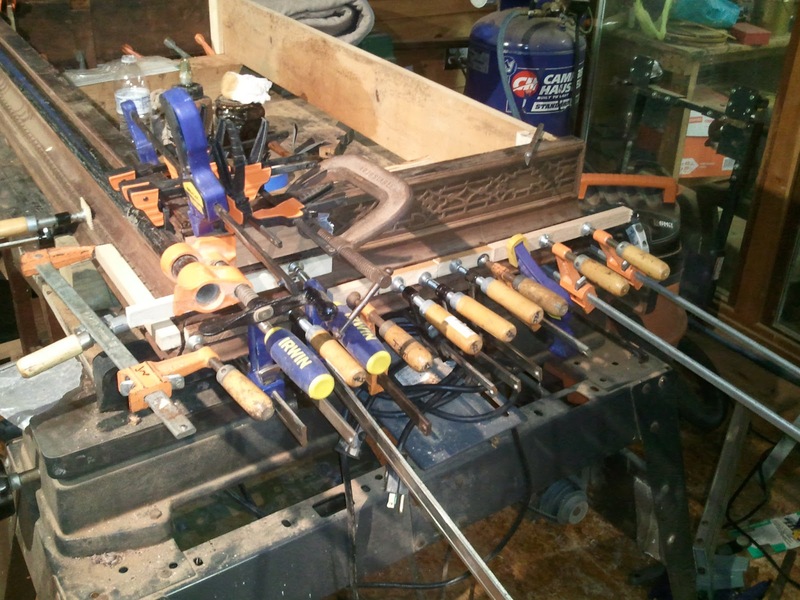 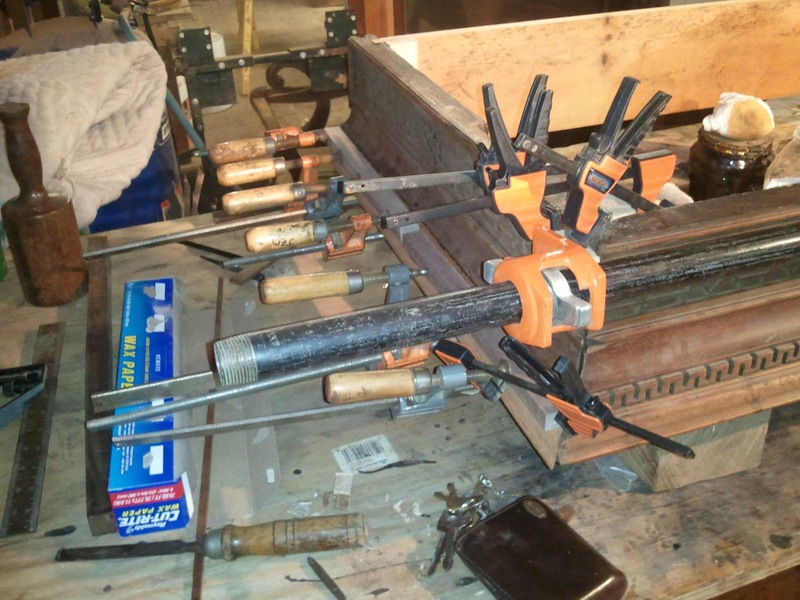 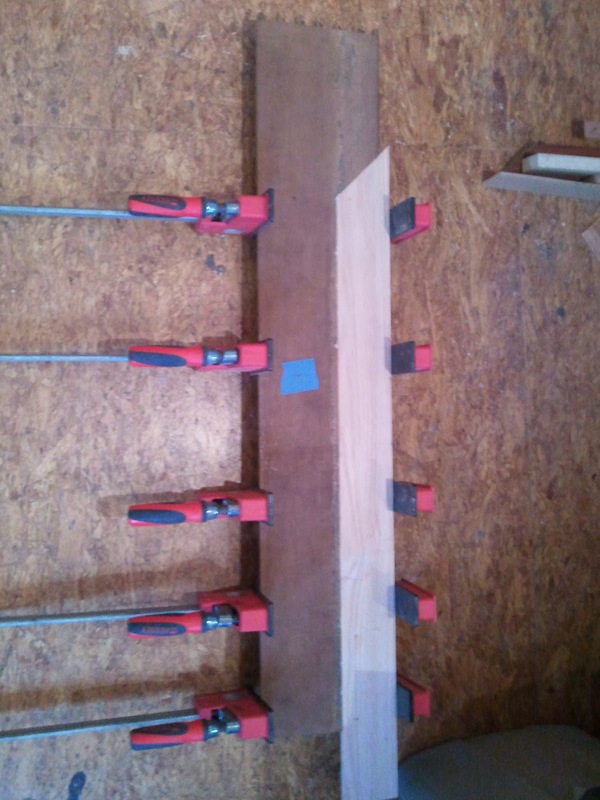 Several gluing sessions were necessary to glue all of the loose molding, beading, and fretwork. 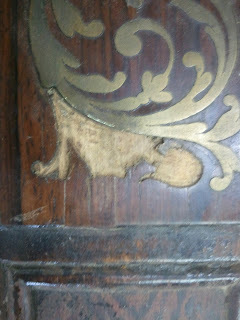 The next few photos show some of this. 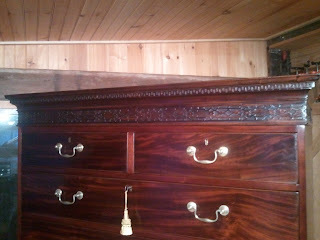 After the cornice was finished, new cockbeading was made for the drawers where it was missing. This photo is a sample of some of the new/loose beading being glued. 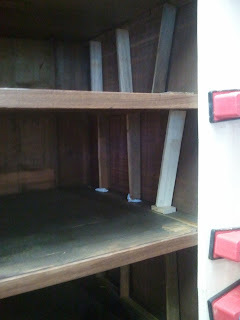 One of the drawers was missing a significant portion of the back board. I included this because the patch I made may possibly have been the largest patch I have made to date! The board is seen below, followed by a close up of the damage, and lastly, the gigantic patch. 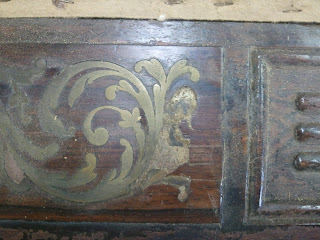 All of the runners on the drawers were worn and broken. 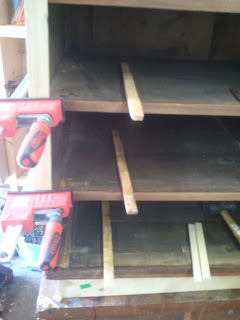 This photo shows the attachment of new wood to the runners on a few of the drawers. 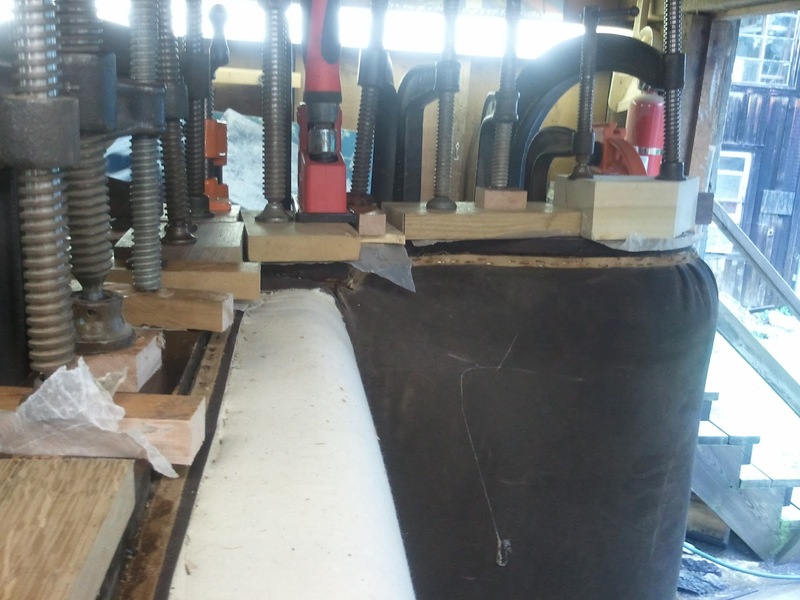 This next photo, another stray, shows a missing runner on the brushing slide being attached. 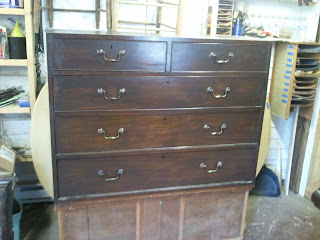 After all of that, the next two photos show the upper and lower chest repaired and sanded. 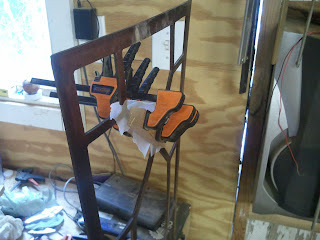 Here they are again after they were stained. 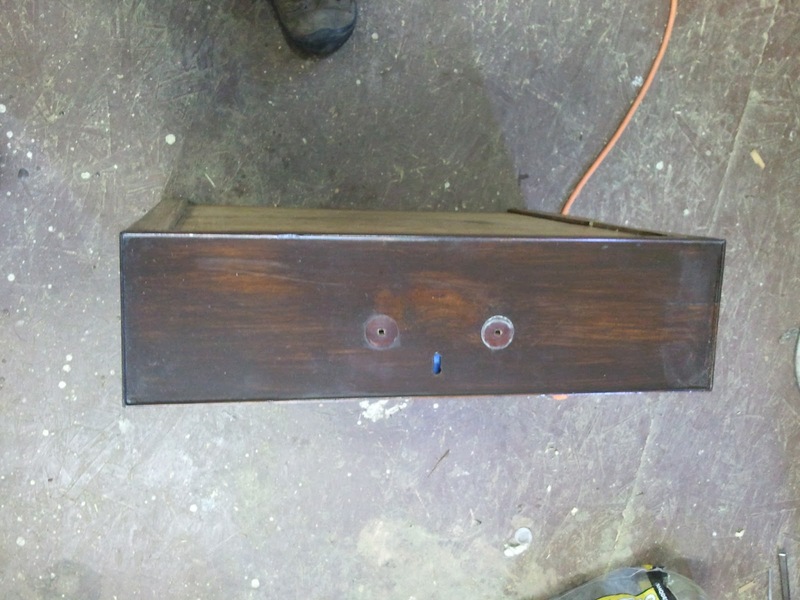 One last piece of repair work that was done during the finishing process was to make and attach new drawer stops for each chest. 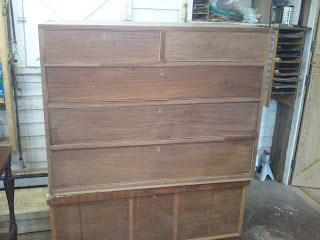 These last few photos show the completed chest on chest. Quite a magnificent piece to grace my shop.